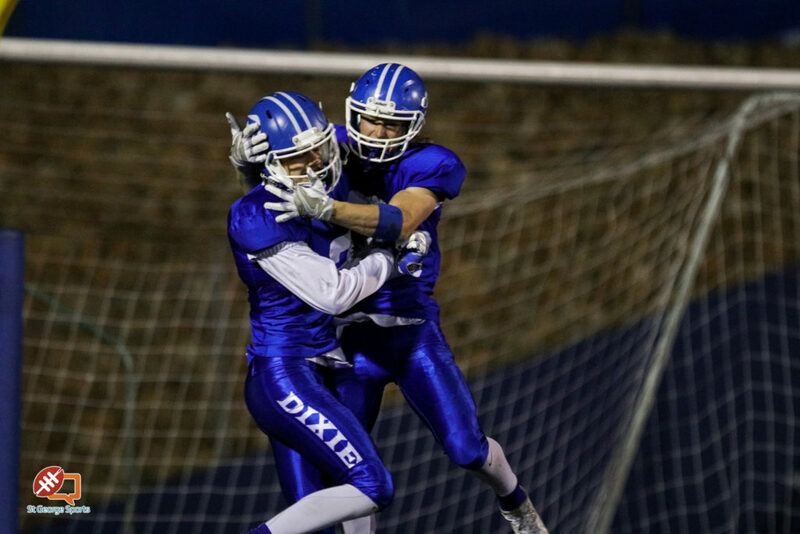 ST. GEORGE – After a tough preseason that included trips to Lone Peak and Alta, Dixie has emerged as the top team in 3AA football, finishing a perfect 5-0 in the 3AA South with Friday night’s blowout win over Hurricane. The Flyers, flexing their offensive muscle against the Tigers, had five first-half touchdowns and will have a bye week to heal up some (hopefully) minor injuries from Week 10. 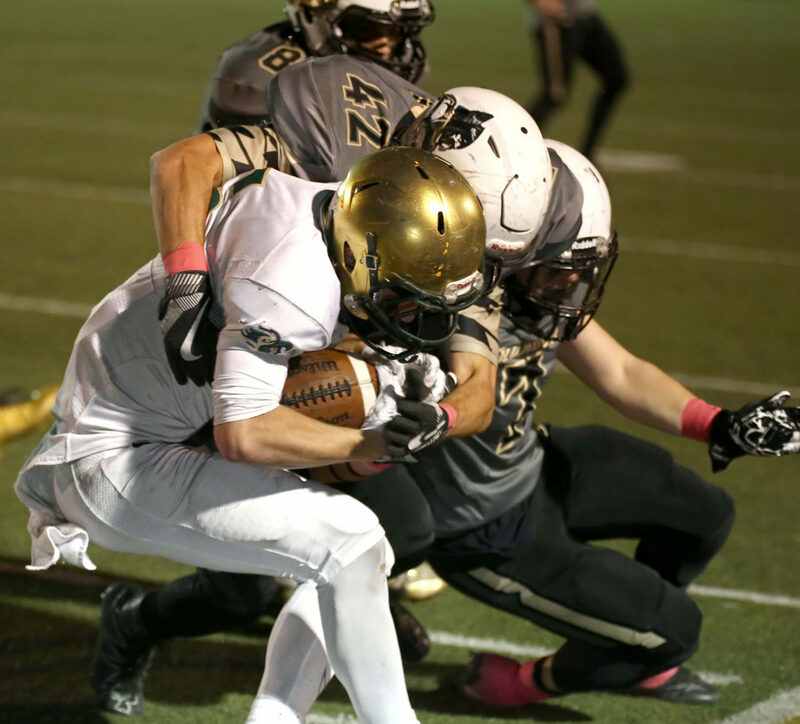 Desert Hills, meanwhile, used defense and the speedy legs of Nephi Sewell to record a two-touchdown win over Snow Canyon. 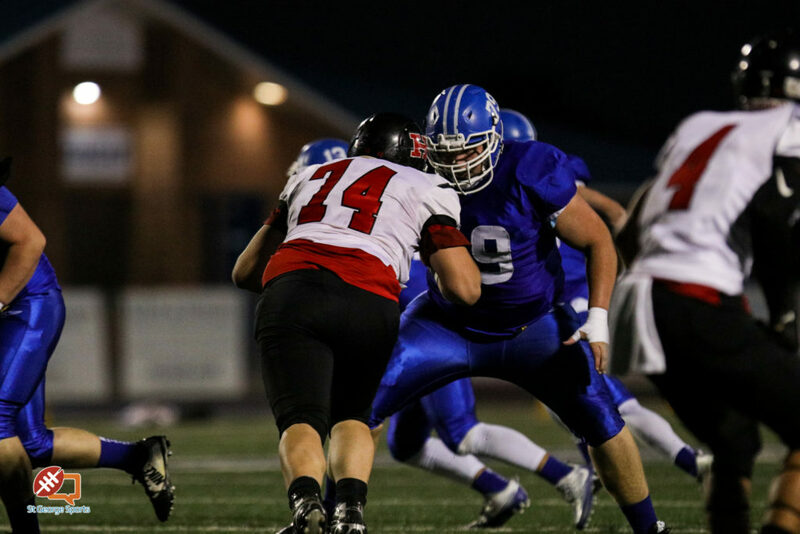 The Thunder will also enjoy a bye week and prepare for the state quarterfinals. 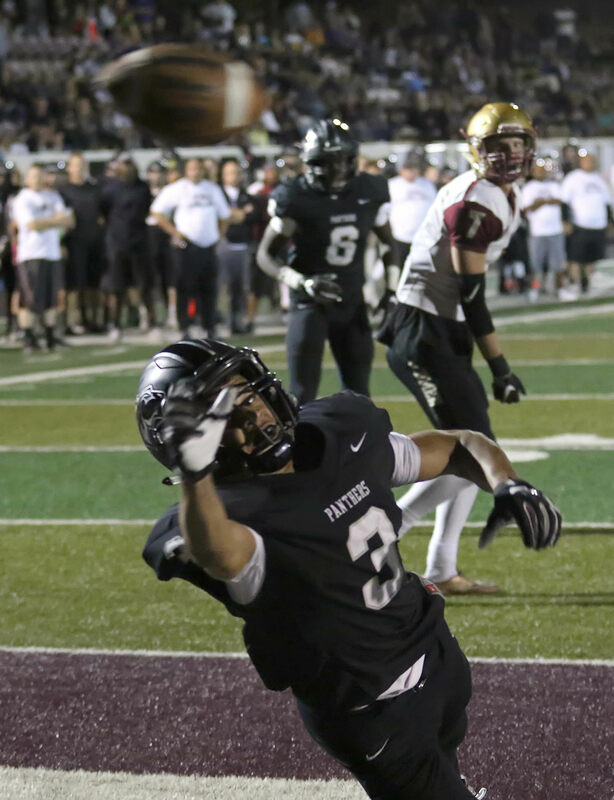 Pine View improved to 7-2 with a close win against Cedar, with penalties almost costing the Panthers their No. 3 seed. 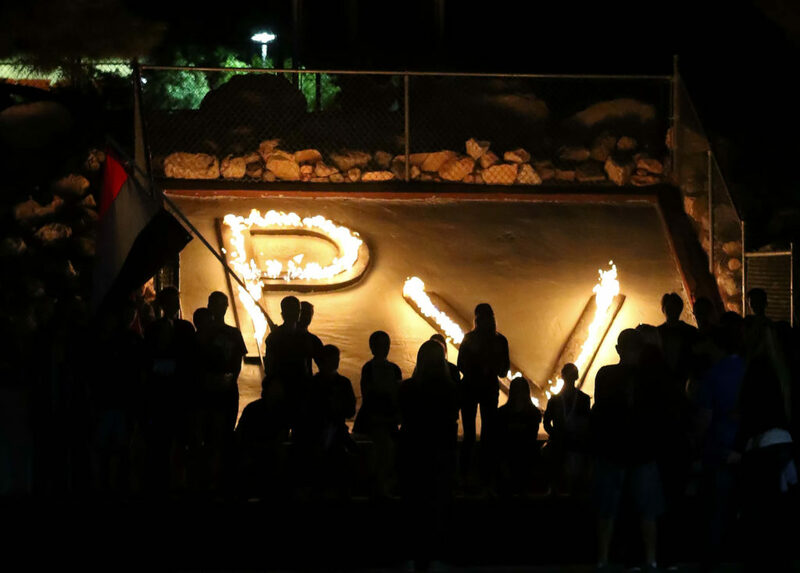 PV endured and will host a first-round playoff game next Friday against the sixth seed from the 3AA North, Ben Lomond. 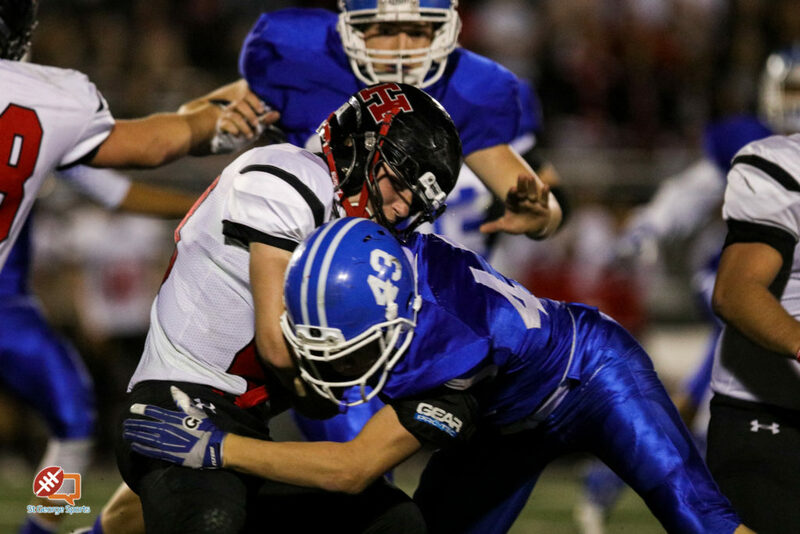 As for the Redmen, Tigers and Warriors, all three ended with disappointing losses on the road. But the good news is that all three will have a chance to prove themselves in the postseason. 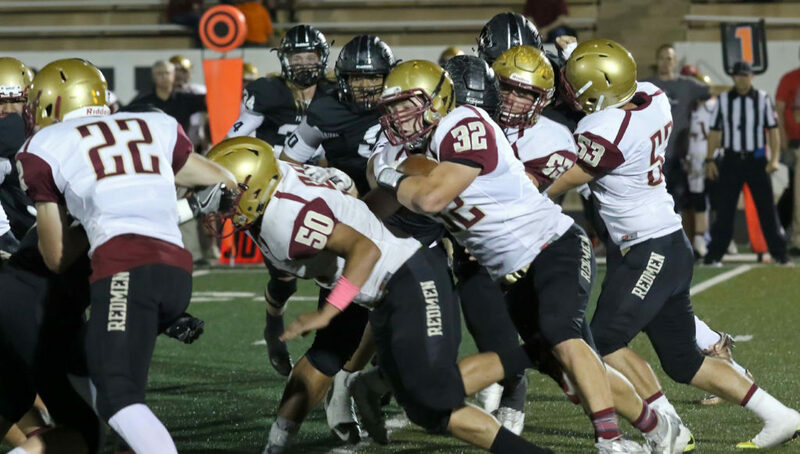 The three teams finished with identical 1-4 region records, so a coin toss was held after the games Friday night to determine the playoff seedings. Cedar came out with luck on its side, winning two coin tosses to obtain the No. 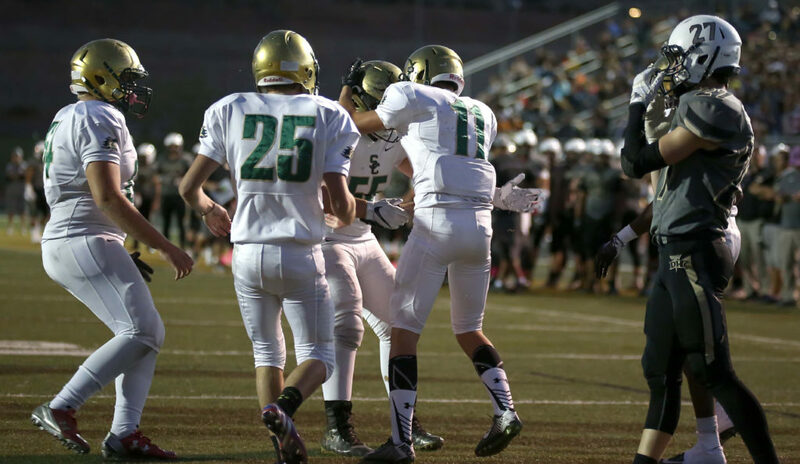 4 seed – which means a home playoff game next Friday against Park City. Hurricane ended up with the No. 5 seed and will travel to Garland to face the Bear River Bears next Friday. And Snow Canyon had the worst luck and will have to settle for the No. 6 seed, which means a trip next Friday to Ridgeline to face the Riverhawks in Millville, which is just south of Logan in the Cache Valley. 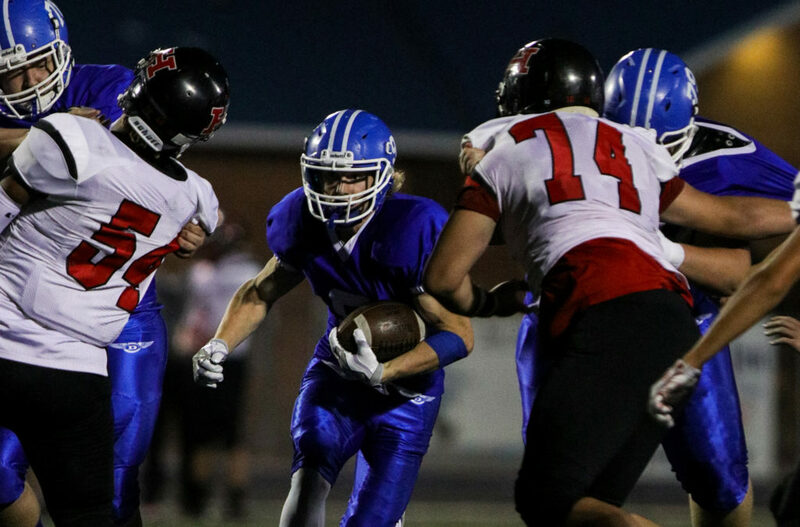 The Rolling Stones famously sang, “I can’t get no satisfaction,” and the Dixie Flyers made clear to anyone who asked that a region title was good, but not completely satisfying. 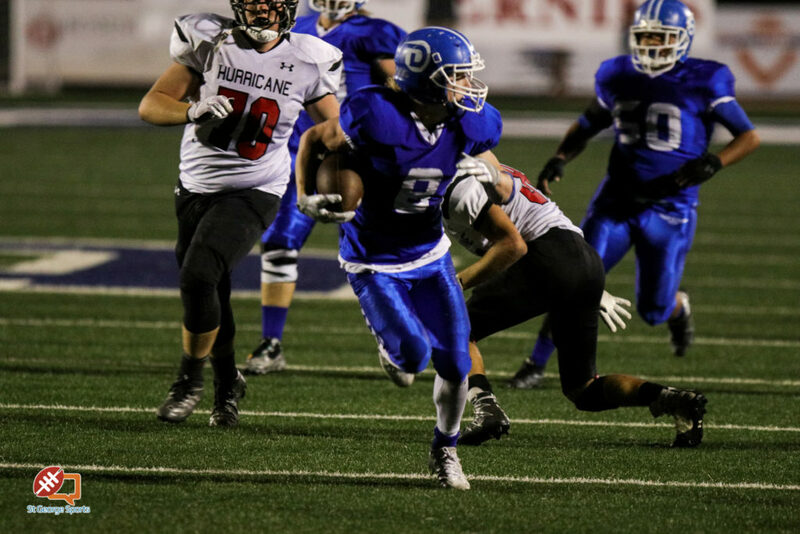 For the first 24 minutes against Hurricane Friday night, Dixie looked like it would able to win the world championship. In a nearly flawless first half, the Flyer offense galloped up and down the field with ease, scoring 35 points and gaining 301 yards on five possessions. 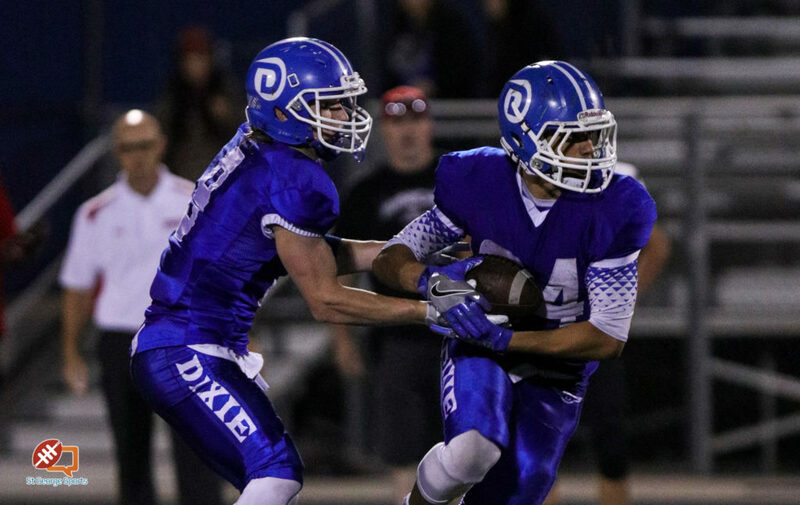 Dixie averaged 9.7 yards per play on those first five drives and went into the locker room ahead 35-7. 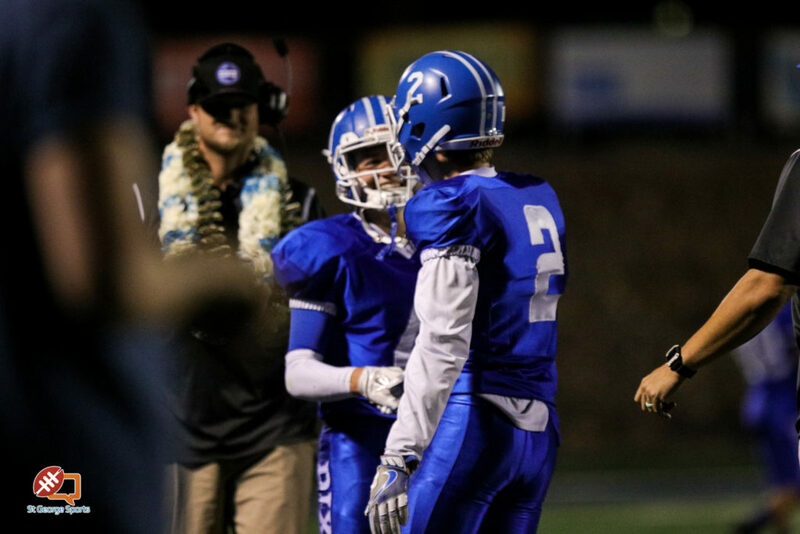 Dixie did have a scare, with stud quarterback Barben hurting his foot in the second quarter and then starting running back Ammon Ah Quin rolling his ankle in the third. But neither injury seems serious and Dixie was in good spirits, especially after Hobbs Nyberg hit a wide open Josh Topham with a 20-yard TD pass late in the first half. 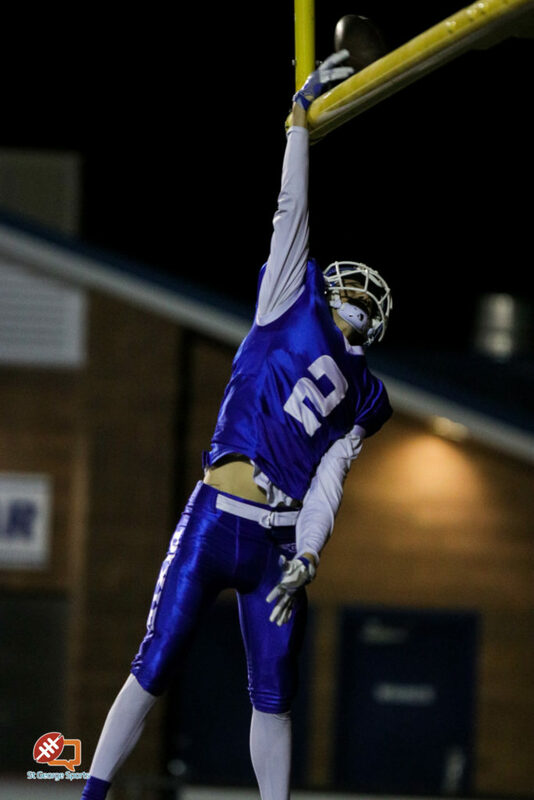 The senior receiver strolled into the end zone – and then dunked the ball over the crossbar, sending the goal post uprights wobbling dangerously to and fro. The throwdown drew a penalty and had many in the crowd wondering if the goal post was coming down. 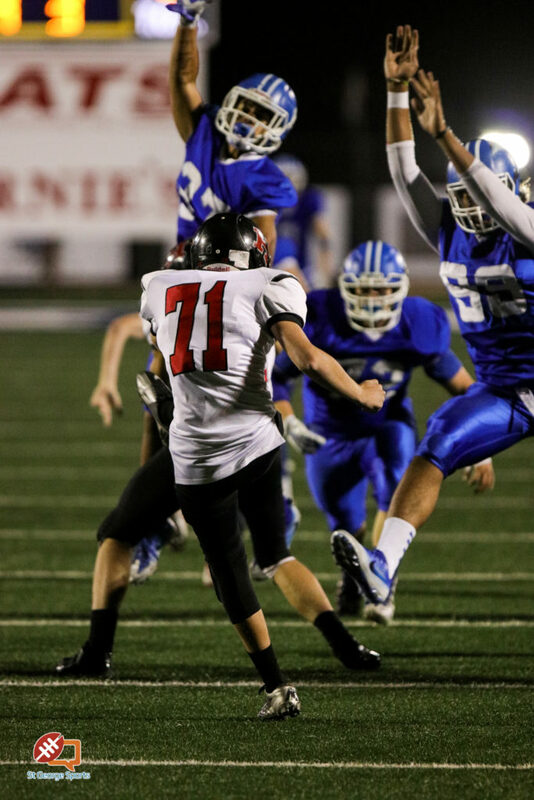 Kicker Thayne Reid had to kick the extra point with the uprights still wobbling. 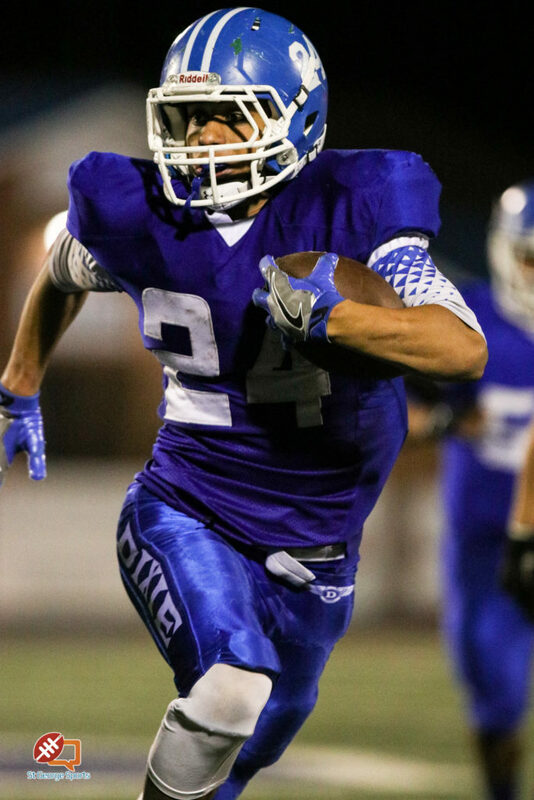 Nyberg was the unquestioned star of the Dixie offense, accounting for 286 yards and four touchdowns while passing, catching and running up and down the Brooks Stadium turf. Nate Mahi, the regular backup quarterback, played that spot for most of the second half as many of the starters on both sides rested after that 35-7 first-half shellacking. 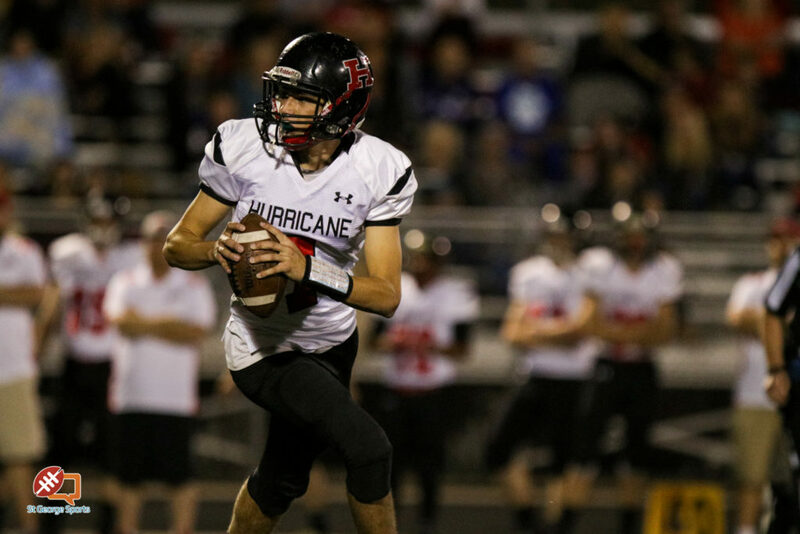 Hurricane didn’t have much luck stopping Dixie and even worse luck moving the ball on offense. The Tigers, known for their ball possession and clock-chewing drives, only had one extended drive in the game. 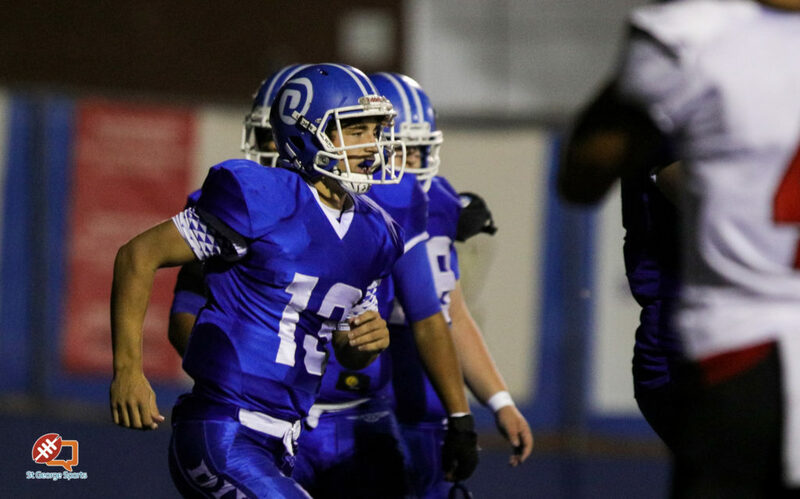 It came at the beginning of the second quarter and temporarily cut the deficit to 21-7. 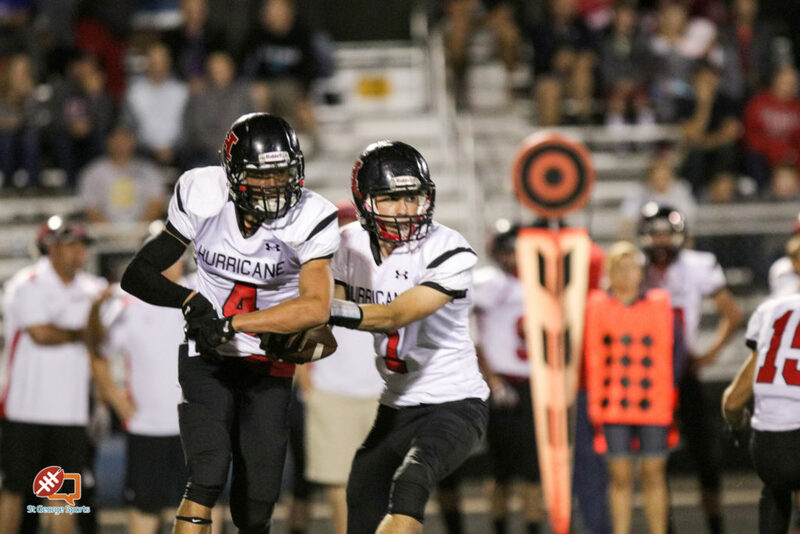 But any thoughts of a comeback were quickly quashed as Teilu Mamea returned the ensuing kickoff 50 yards to the Hurricane 26 and two Nyberg runs later, it was 28-7. 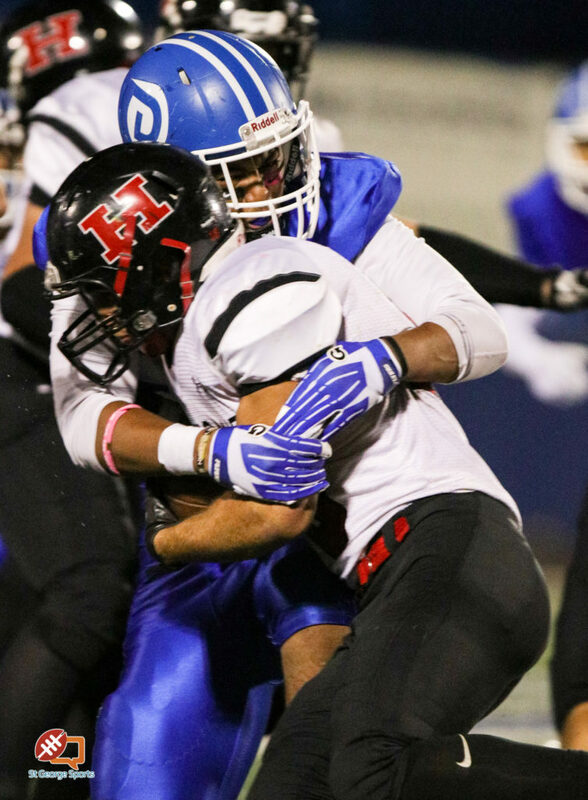 Cordova had 94 yards on 18 carries, perhaps the lone bright spot on a dreary day for the HHS offense, which gained just 215 yards in the game. 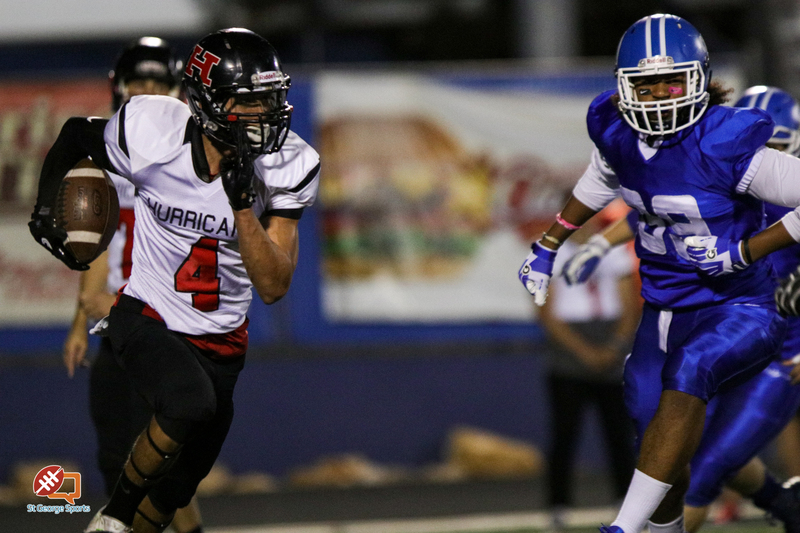 Dixie ended up with 461 yards and had zero turnovers in the game (Hurricane had two). 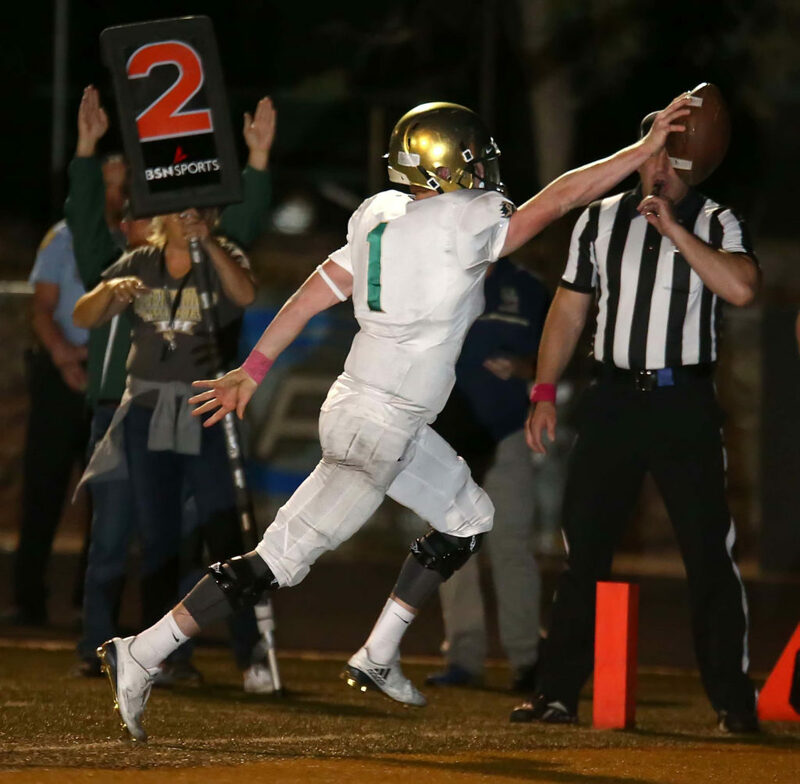 The Flyers, 6-3 and on a six-game winning streak after starting the year 0-3 against Springville, Lone Peak and Alta, take a bye next week in the first round before facing the winner of Hurricane and Bear River – yep, it could be another Hurricane-Dixie game at Brooks Stadium in two weeks. 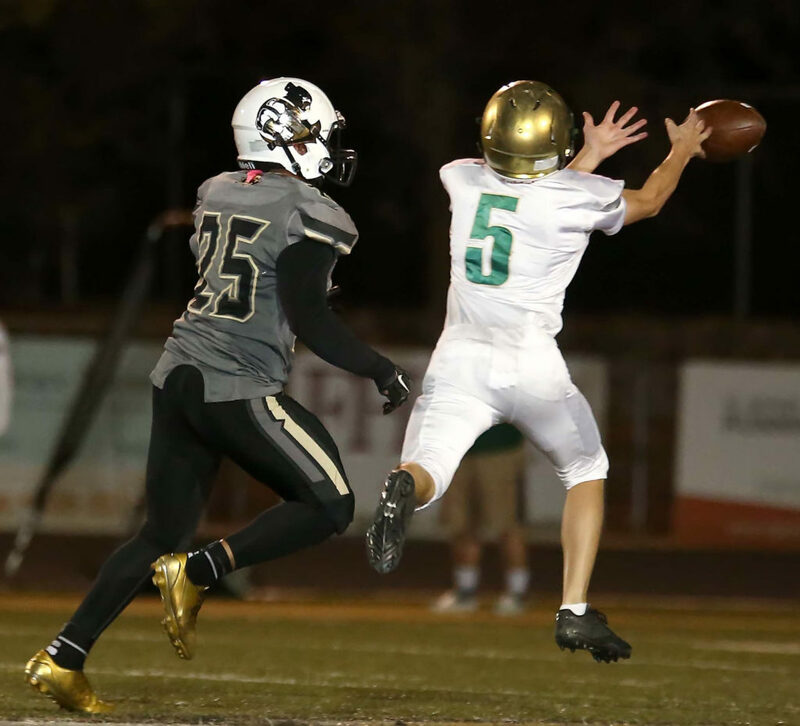 Hurricane, 3-6 and on a four-game losing string, has given up 44.8 points a game since a region-opening win against Snow Canyon. 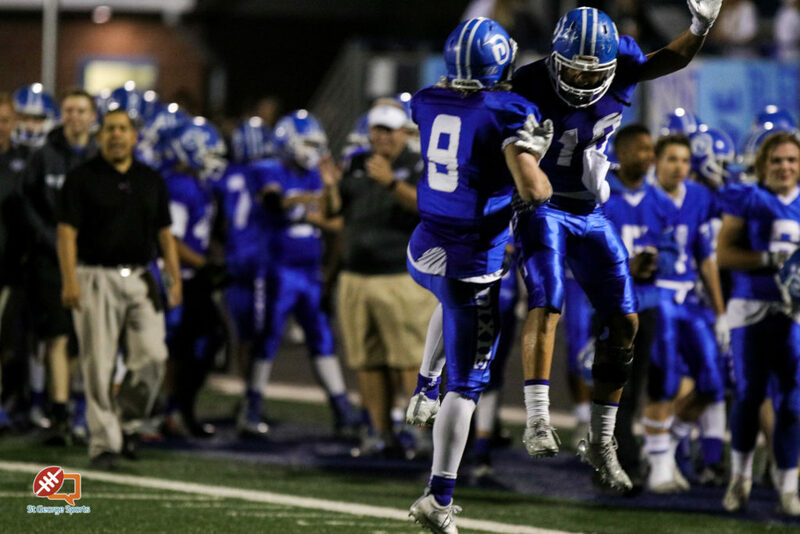 The Tigers travel to Garland to face the Bears Friday with a 4 p.m. scheduled kickoff. 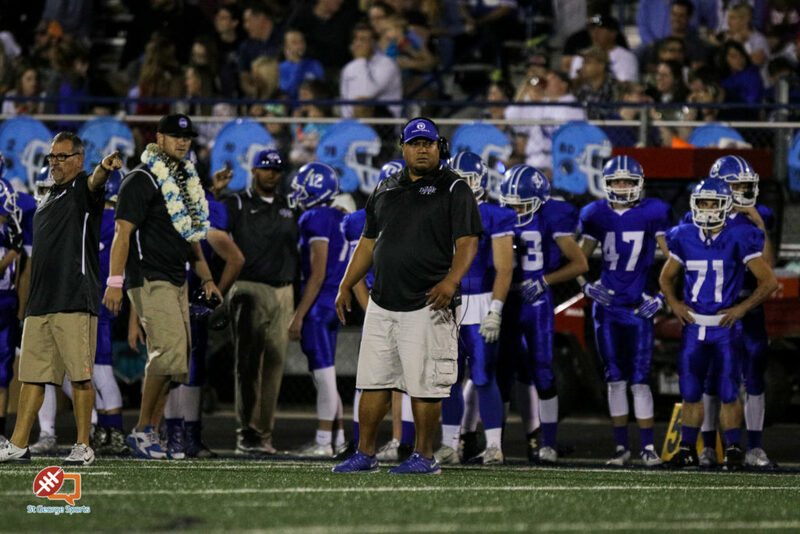 Halftime is often about adjustments to the game plan. 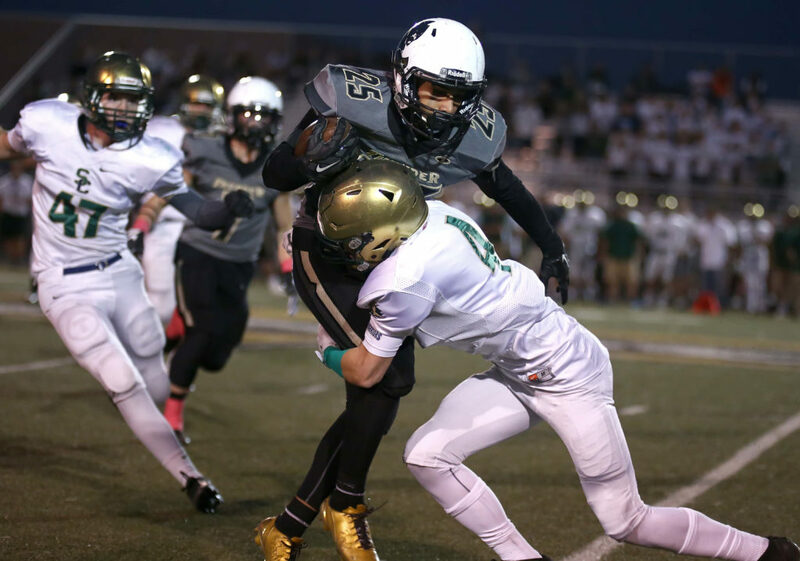 For Desert Hills Friday night against Snow Canyon, the halftime discussion was more … motivational in its tone. 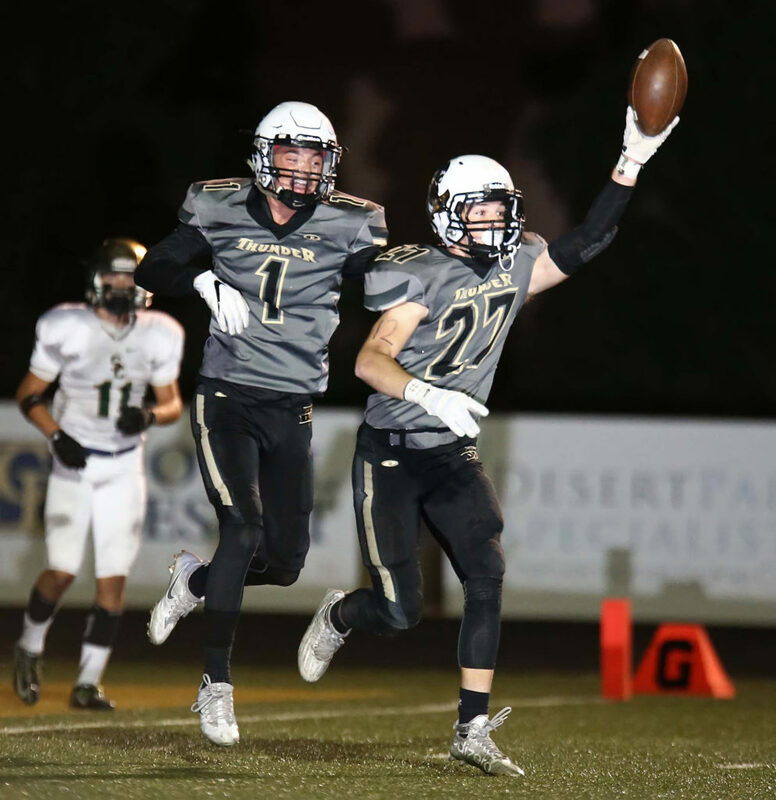 Yes they did, as Desert Hills shutout the Warriors after intermission to capture a measure of revenge after getting ousted from the playoffs by Snow Canyon last season. Turnovers were the biggest story in the second half. 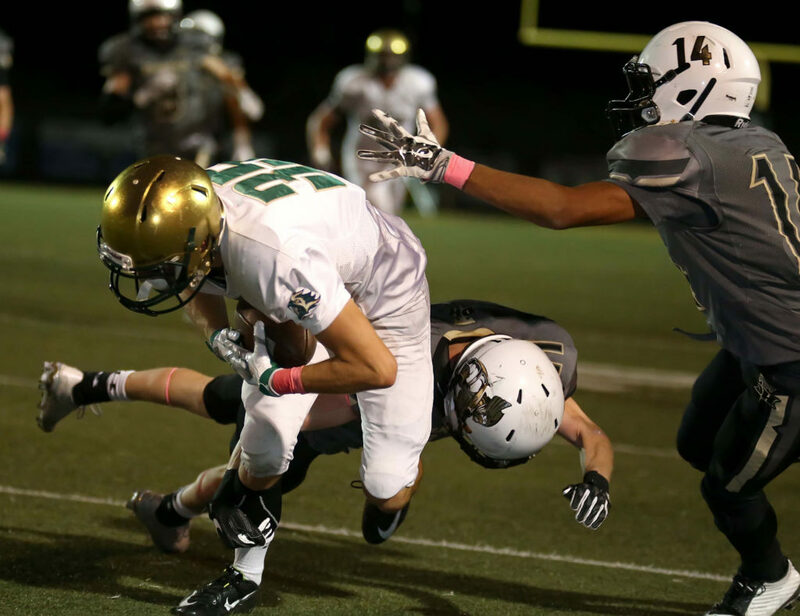 They kept Snow Canyon from tying the game up and they kept Desert Hills from pulling away. The second half started with a big turnover forced by the Warriors. 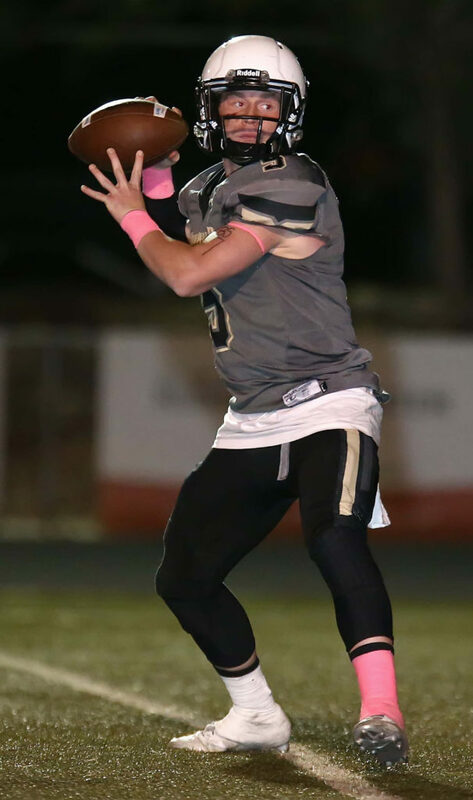 After Desert Hills forced a three-and-out, quarterback Quinn Kiser drove the Thunder 44 yards in six plays down to the Warrior 14-yard line. 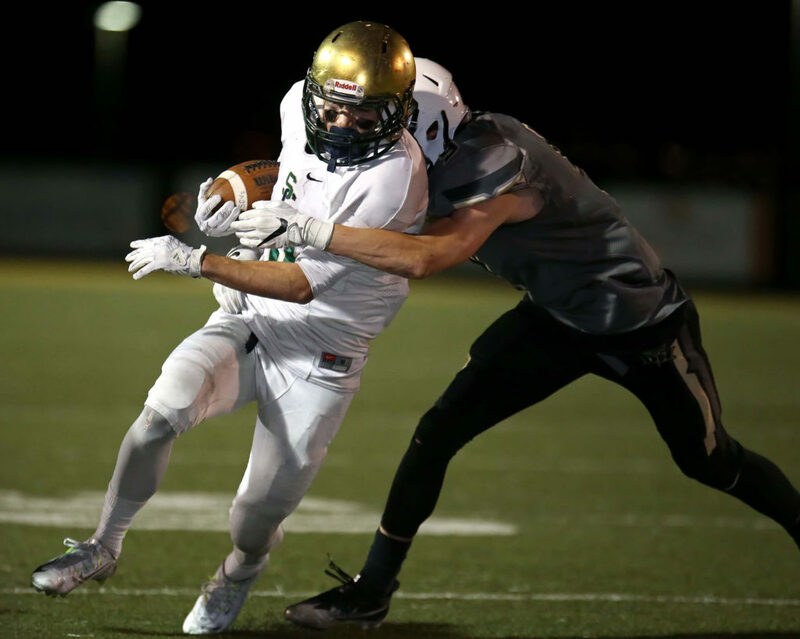 On the next play, Snow Canyon defensive back Parker Ence intercepted the Thunder pass 1 yard deep in the end zone. 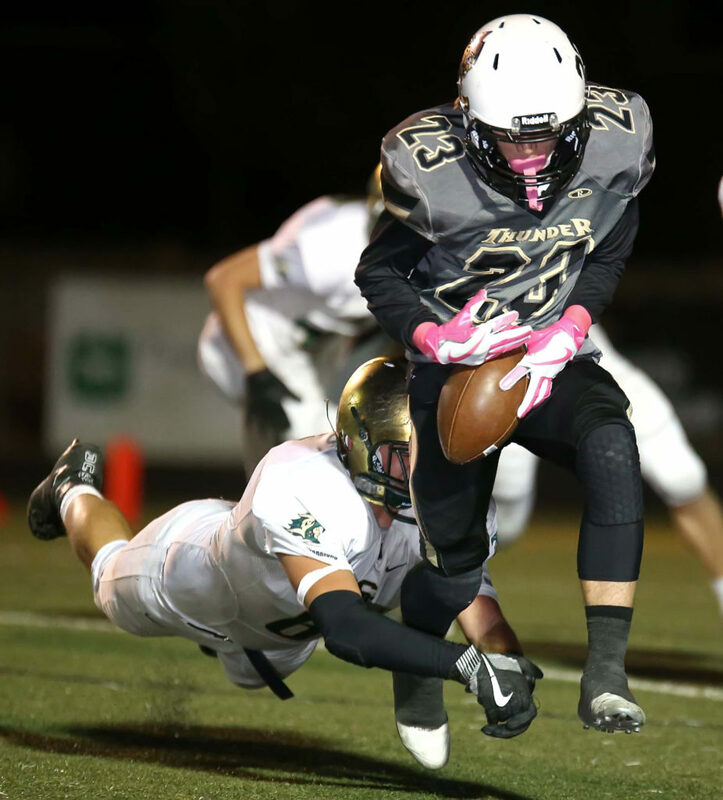 After the teams traded punts, Snow Canyon drove 32 yards before stalling. A 46-yard field goal attempt by Kotlon Barber had the distance, but was wide left. 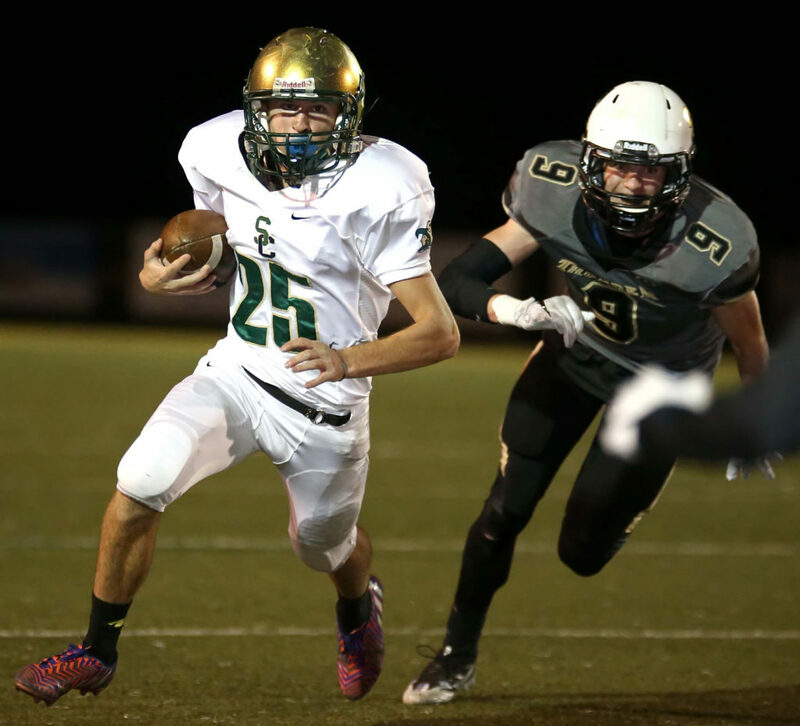 On Snow Canyon’s next possession, the Warriors gained 46 yards to the Thunder 5-yard line. 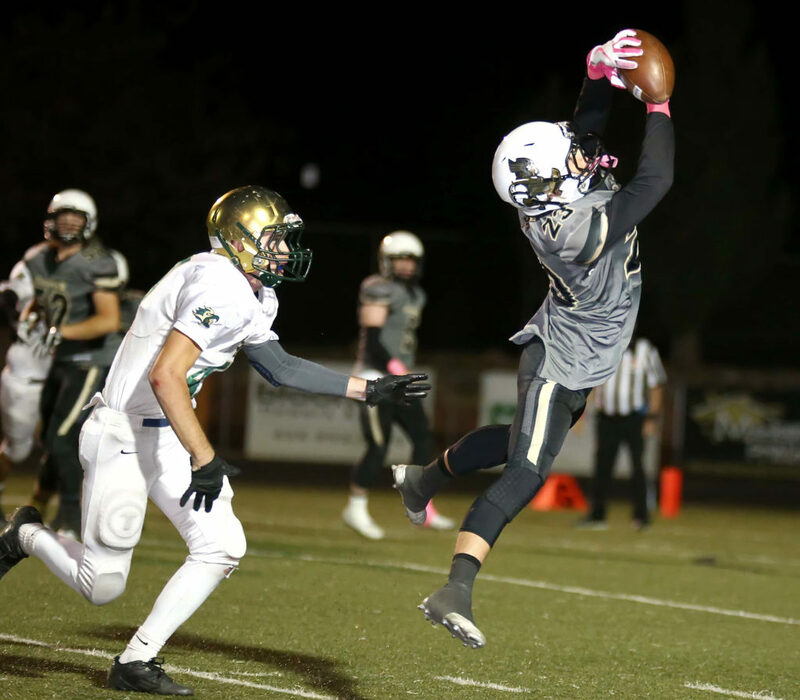 It was Desert Hills’ turn to get an interception in the end zone as Hunter Holt got the touchback. After a Thunder three-and-out, Snow Canyon drove again. After two first downs and 36 yards, the Thunder defense saw opportunity arise anew when the Warriors had a miscue on a handoff. 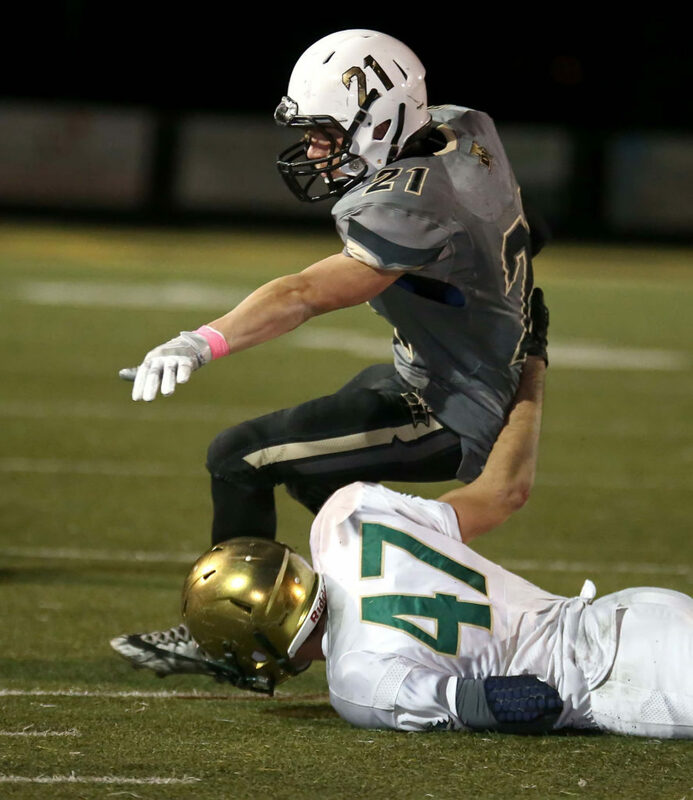 Thunder defensive back Carter Reynolds hopped on the loose ball for the turnover with 5:59 remaining in the game. 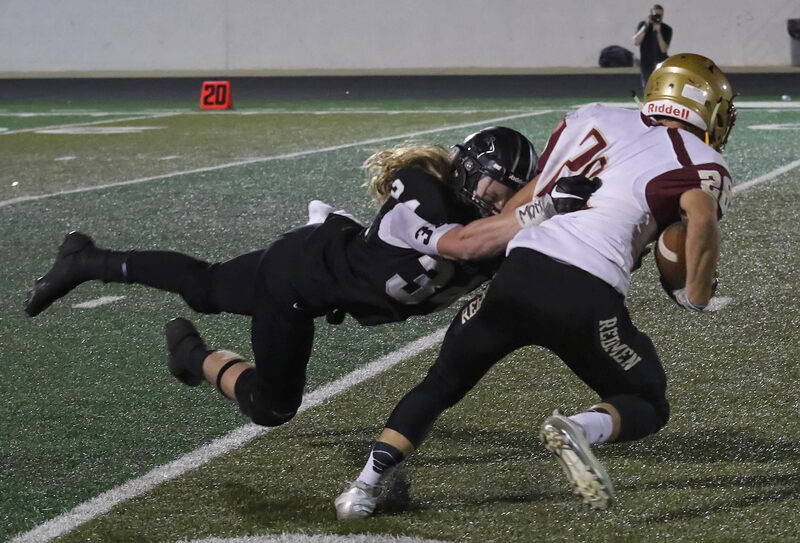 On the only sustained drive of the second half, Kiser drove the Thunder 65 yards in 10 plays, culminating in a 13-yard touchdown run around the right side by running back Brock Parry. The key play on the drive came on third-and-21 near midfield with just under two minutes to play. Kiser found Logan Hokanson over the middle for 24 yards and a crucial first down. 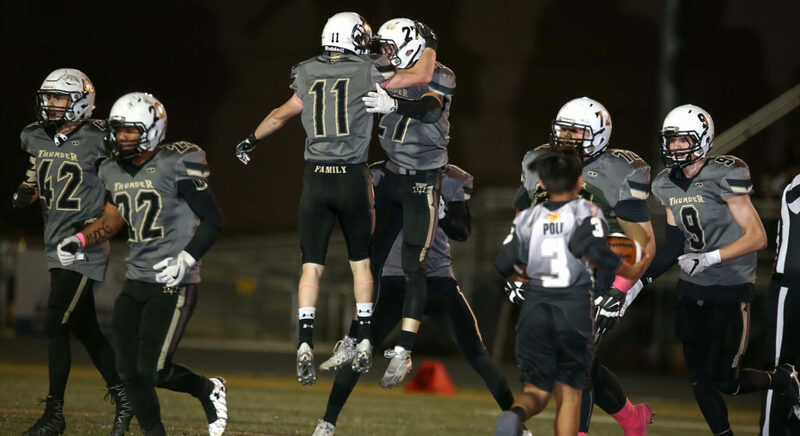 Even more important than grabbing the two-score lead, Desert Hills ran five-plus minutes off the clock. 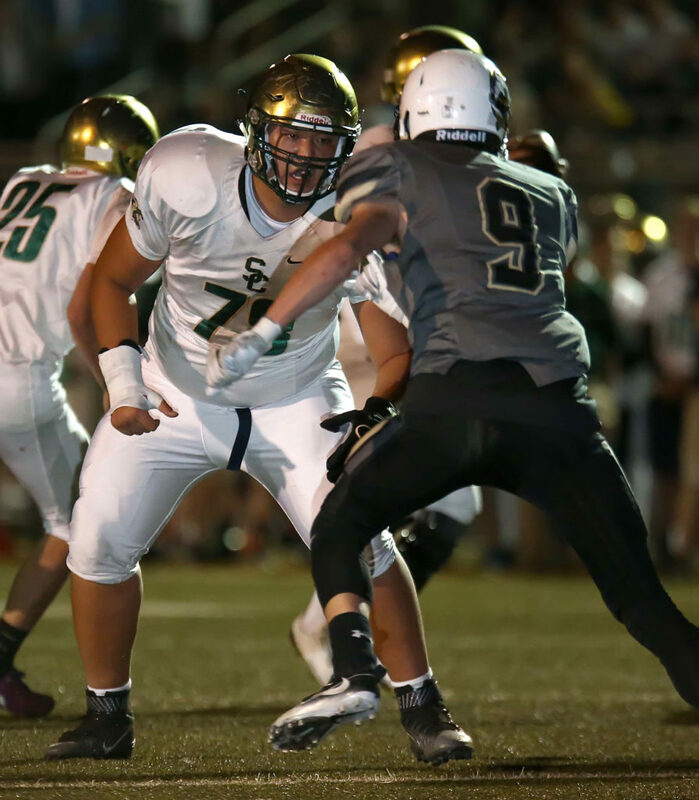 Snow Canyon’s hopes were dashed once and for all when DH linebacker Masan Tuileta intercepted the ball with 46 seconds remaining. 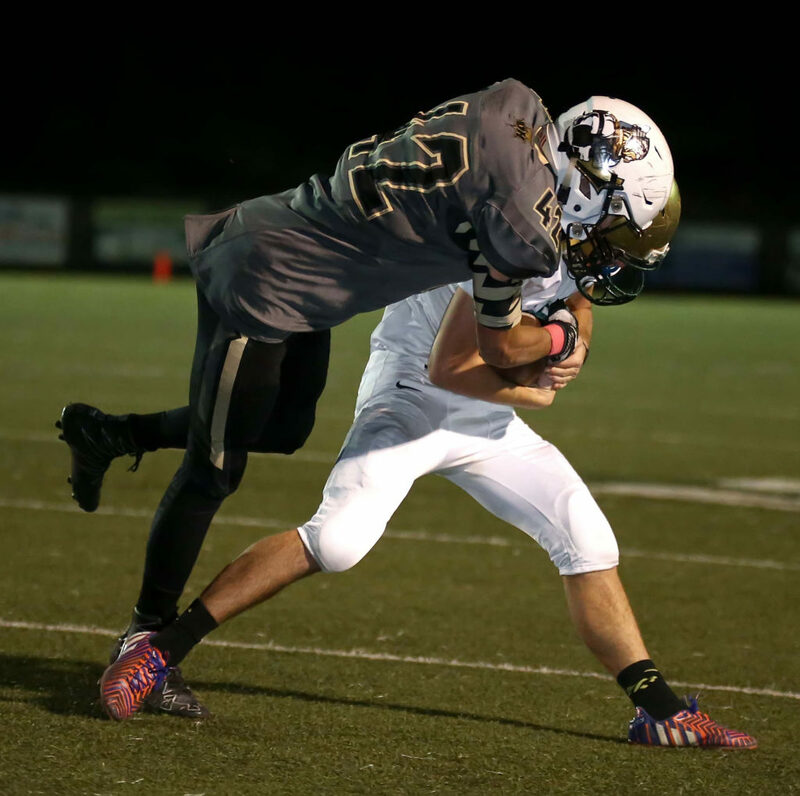 “Masan jumped in front of me and stole my interception,” said a smiling Hoppie. The Thunder then knelt down and ran out the clock. The game initially went the Warriors’ way. 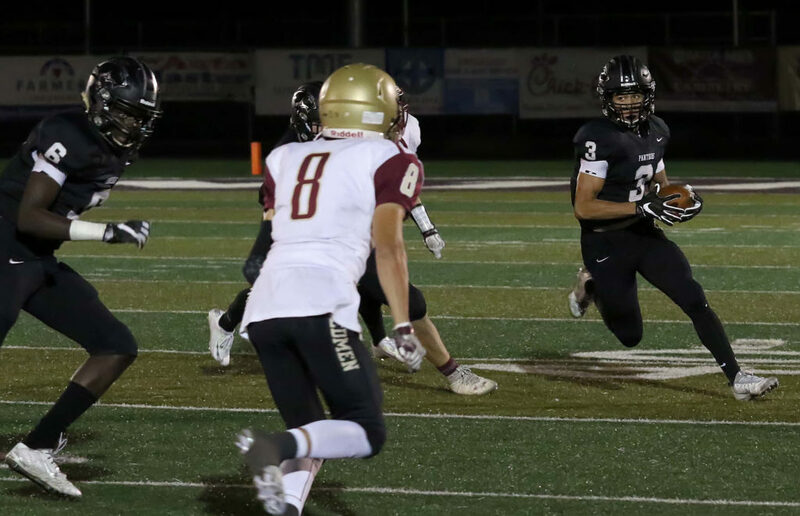 After Desert Hills fumbled on its first play of the game, the Warriors took immediate advantage, driving 23 yards and scoring on a pass from quarterback Matt Kitchen to Zach Nowatzke. 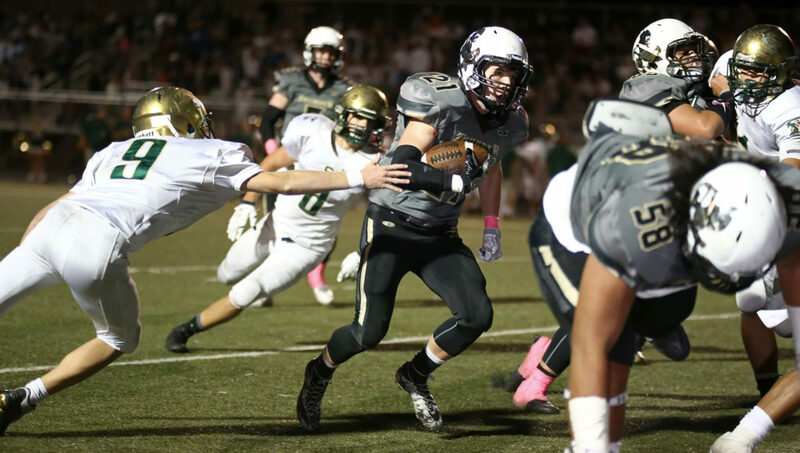 Desert Hills countered on its next possession when Nephi Sewell scored on a 38-yard run. The Thunder grabbed their first lead in the second quarter when Kiser found Hokanson on a 12-yard pass. 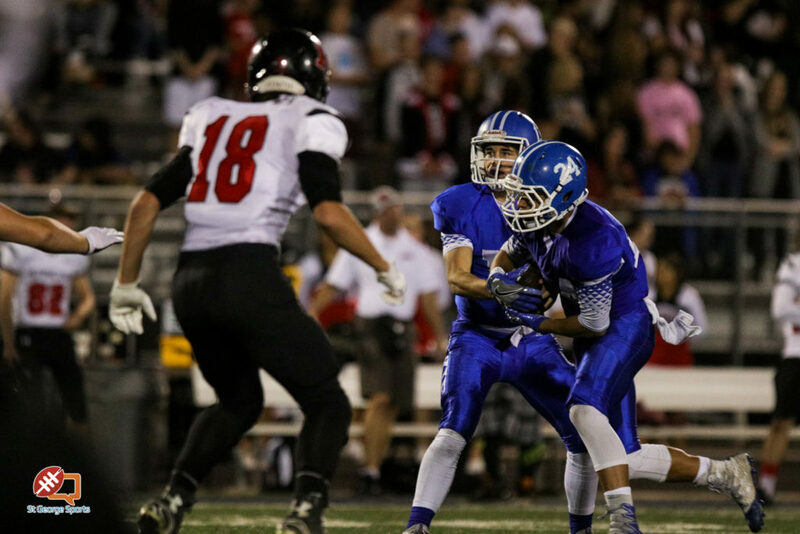 Hokanson was the ball carrier that fumbled on the first play of the game. He would make several big catches for the remainder of the game for first downs. 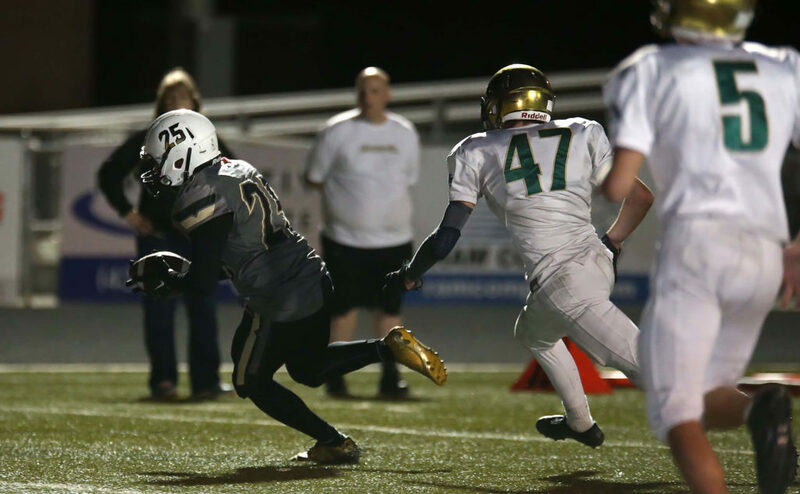 On Snow Canyon’s ensuing possession, Kitchen drove the Warriors 80 yards for the tying score. Kitchen corralled a high snap and raced to the left for the 1-yard TD run. 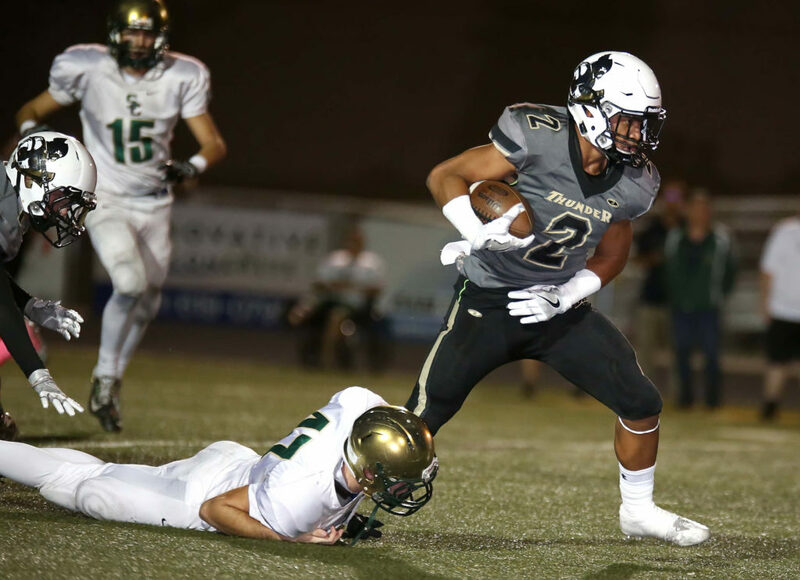 As the clock was winding down on Desert Hills’ last possession of the first half, Sewell ripped off a 64-yard run to the Warrior 28-yard line. 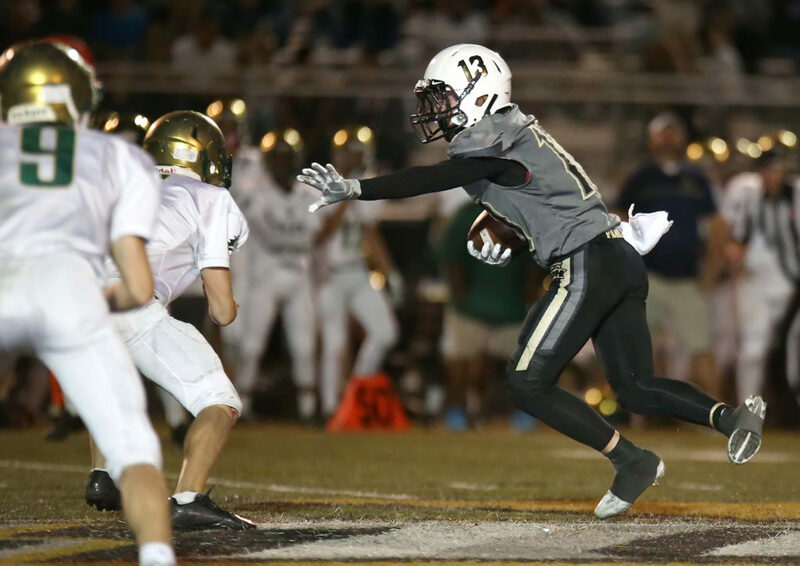 Six plays later, Kiser found Marco Jordan from 5-yards out for the score to put Desert Hills up 21-14 going into the locker rooms. 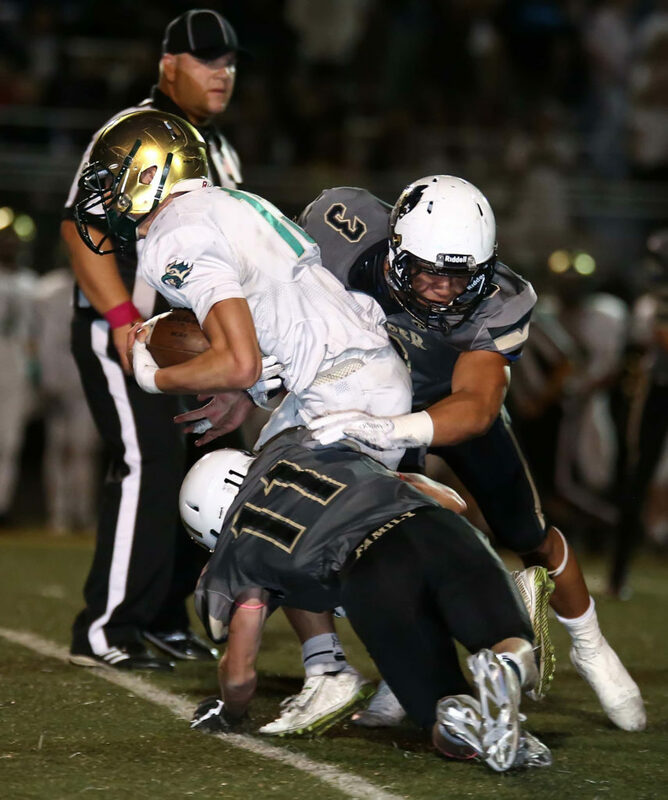 For the game, Desert Hills outgained the Warriors 349-261, but more importantly won the turnover battle 5-2. 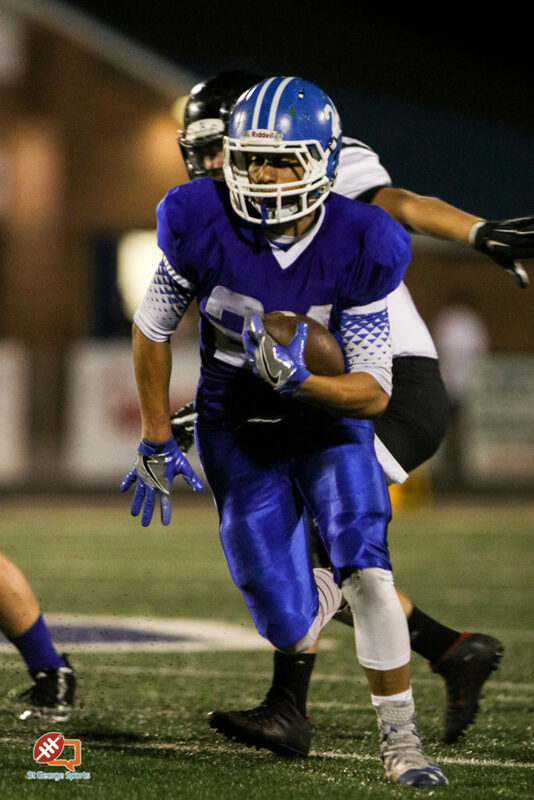 Individually, Sewell had 163 yards on 17 carries. 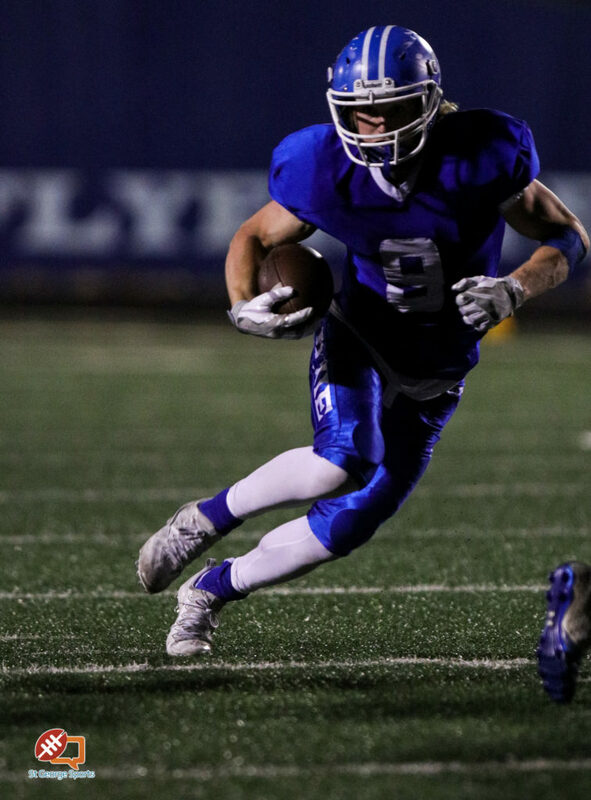 Hokanson had 81 yards on seven receptions. 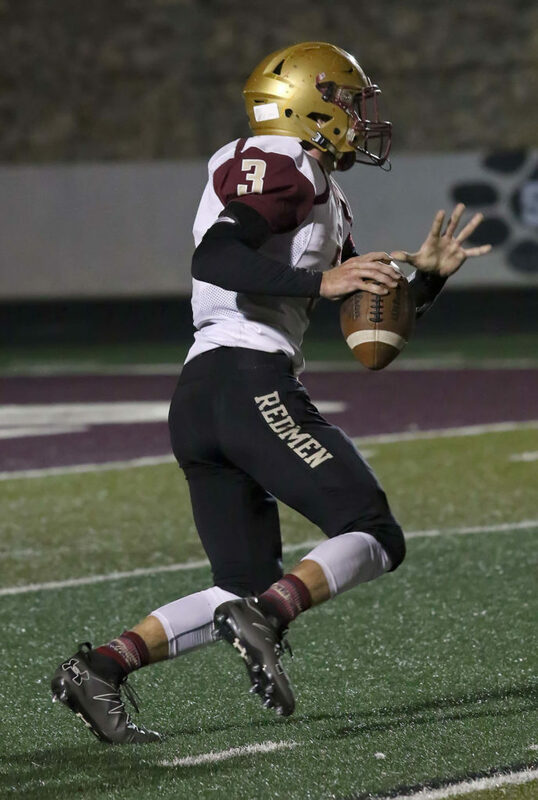 Kiser completed 12 of 28 passes for 126 yards. Individually for Snow Canyon, Kitchen completed 12 of 32 passes for 117 yards. 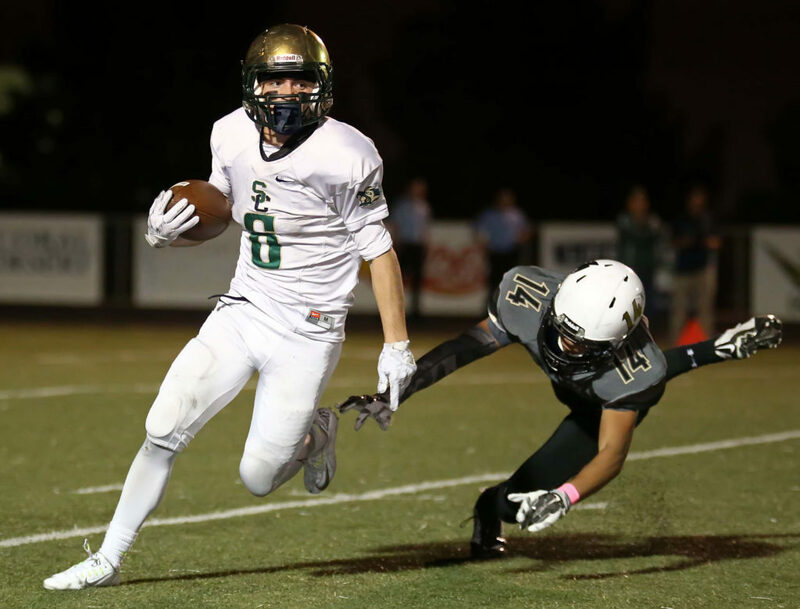 Chris Poulsen carried the ball 17 times for 60 yards. Nowatzke caught three passes for 23 yards. 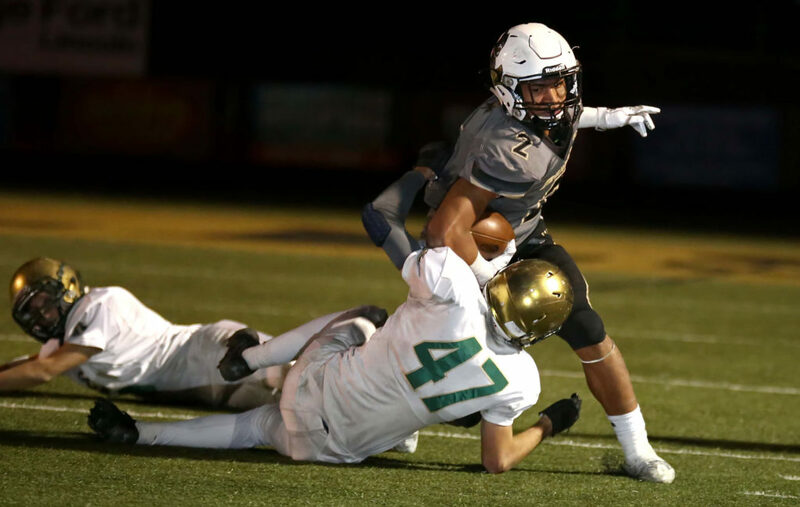 With the win Desert Hills finishes with an overall record of 7-2 and second in the region at 4-1. 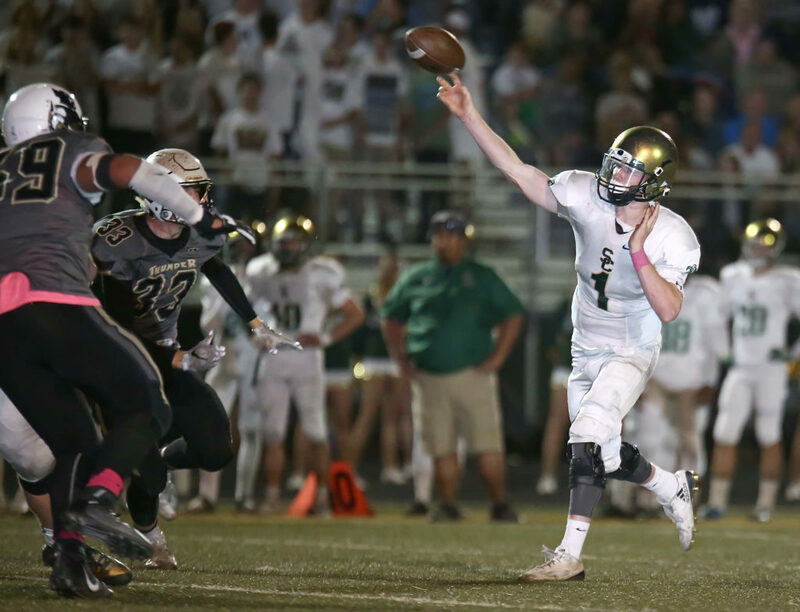 The Thunder earned a bye next week and will face the winner of Snow Canyon and Ridgeline in two weeks – yep, it could by D-Hills-Snow Canyon again in two weeks. The Warriors drop to 1-4 in region and 3-6 overall and will travel to Millville (south of Logan) next Friday. 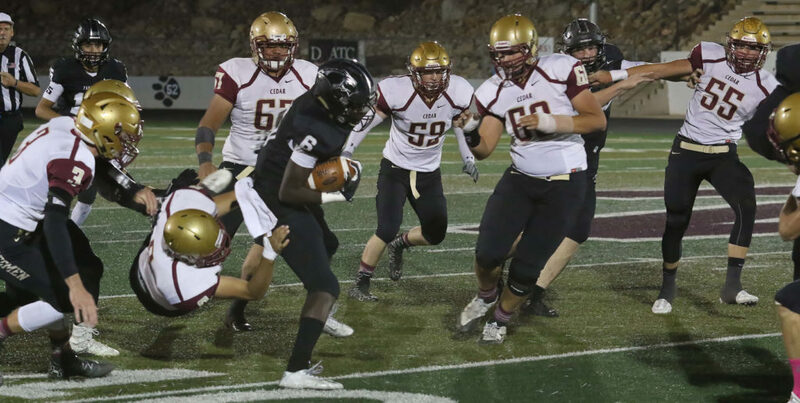 Kickoff is tentatively scheduled for 4 p.m.
Jacob Mpungi’s 3-yard touchdown with 100 seconds remaining and a defensive stand that ended on the Panther 20-yard line lifted Pine View to an 18-13 Class 3AA South win over Cedar City on Friday night. 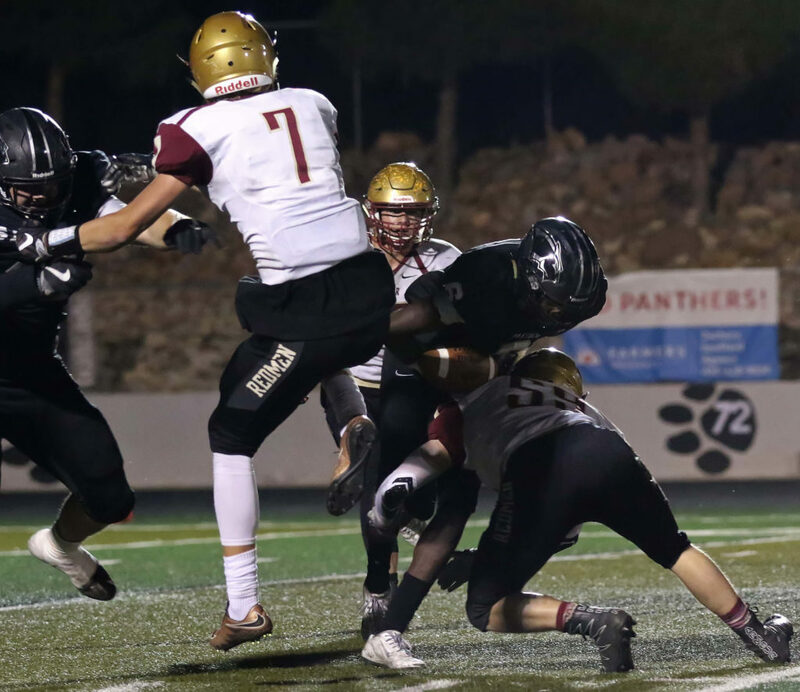 Pine View (3-2, 7-2) took a 12-0 lead into the fourth quarter but needed a 10-play, 62-yard drive at the end to secure the win. “There was no panic in your eyes on that last drive,” assistant coach Todd Shaw told the players as they celebrated the win. Mpungi had three runs and a pass reception on that final drive. He fumbled on one play, but the Panthers recovered. “I was really scared,” he said of that mistake. An earlier fumble had given Cedar (1-4, 4-5) the ball on the Panther 17-yard line. Parker Haney’s recovery gave the Redmen the opportunity to score the go-ahead touchdown. Trenton Maurer’s 2-yard run gave them a 13-12 lead with 4:53 left in the game. 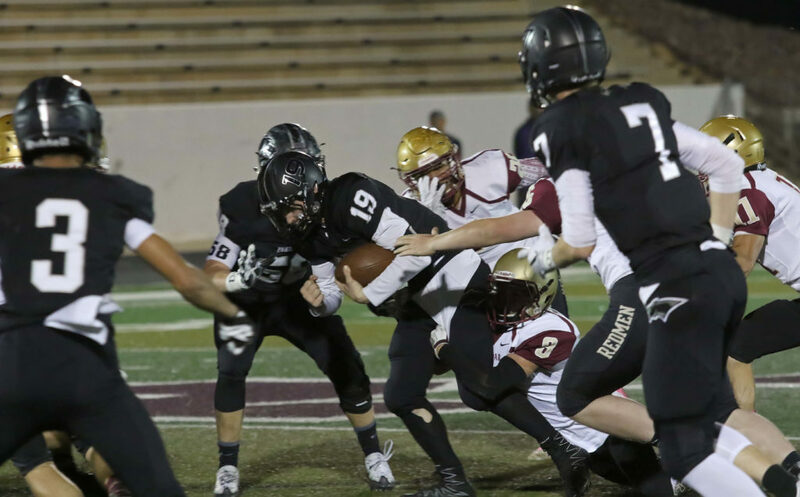 Pine View took a 9-0 lead in the first quarter. 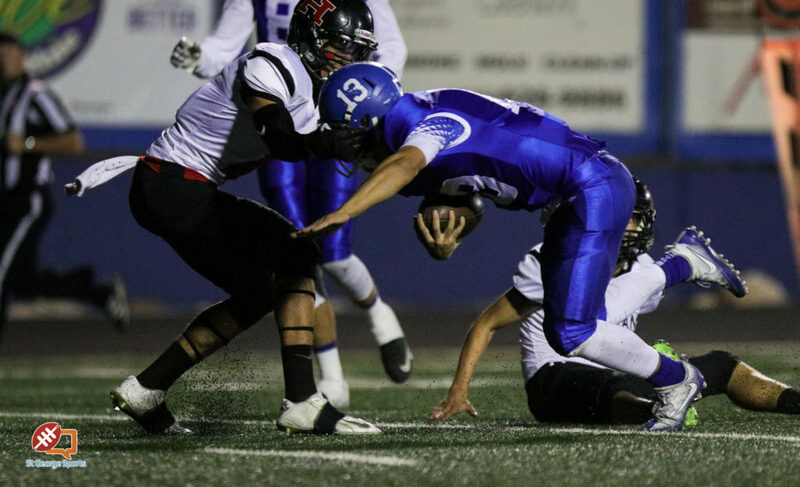 They scored a safety when Cedar quarterback Braden Garrett was tackled in the end zone by Christian Reis. Mpungi scored on a 25-yard run to cap a 44-yard drive following the ensuing free kick. 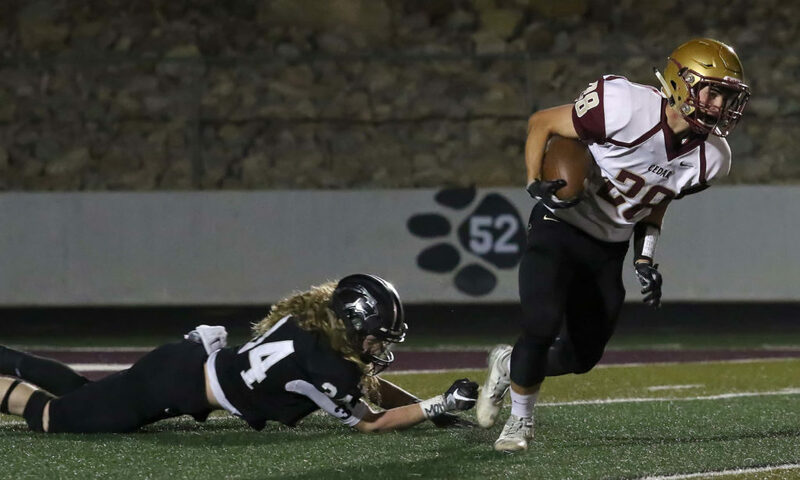 Pine View expanded its lead when Conner Brooksby kicked a 35-yard field goal in the second quarter. He missed a 48-yard attempt on the final play of that period. 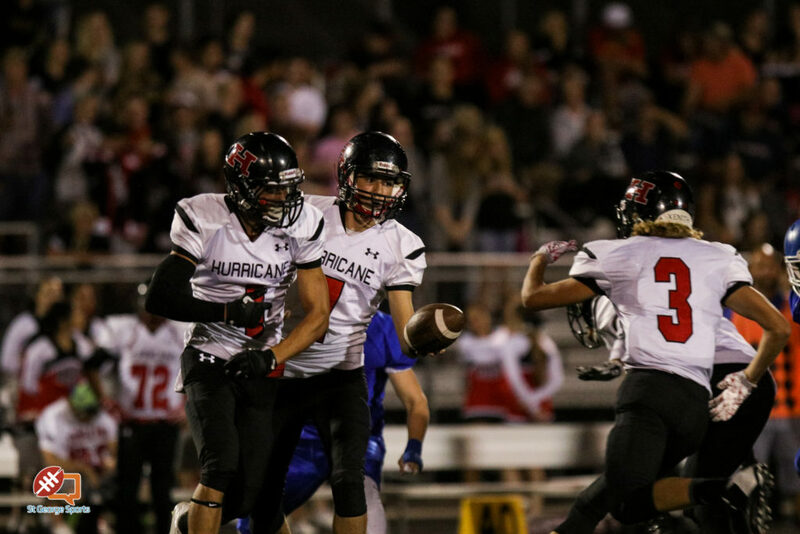 In the fourth quarter, the Redmen broke through when Garrett passed 43 yards to Derek Ball and Travis Tait carried the ball the remaining 24 yards in three plays. 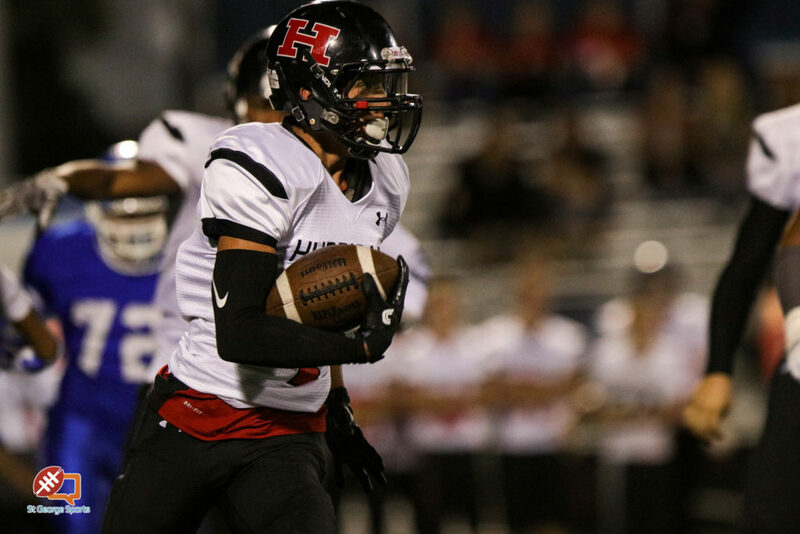 One play later, the Redmen had the ball courtesy of Haney’s play. 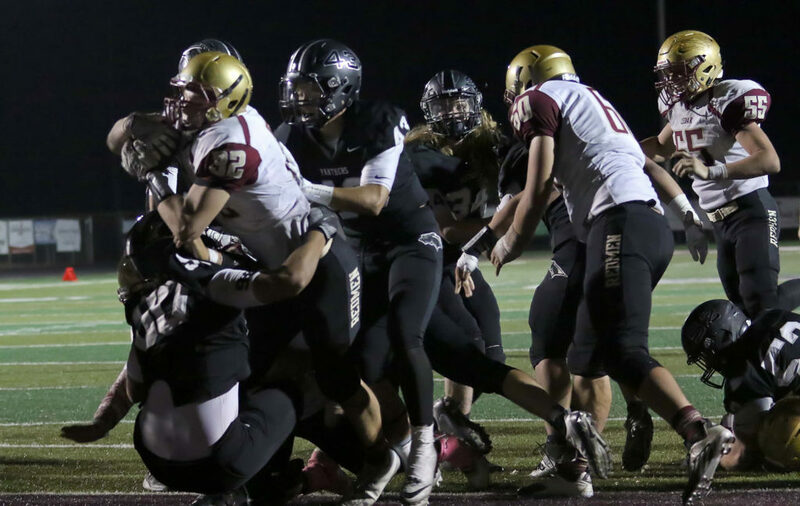 “Our kids, once they realized it, they became resilient, our receivers did a great job and our quarterback did a fabulous job,” Pine View coach Ray Hosner said of the final frantic minutes. 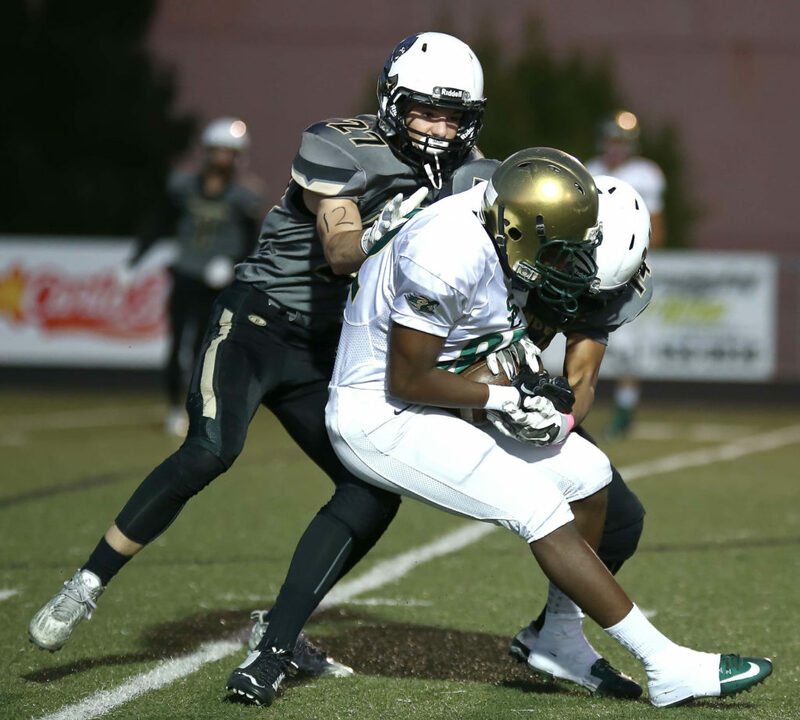 Cedar got the ball to the Pine View 20-yard line in the closing seconds of the game. 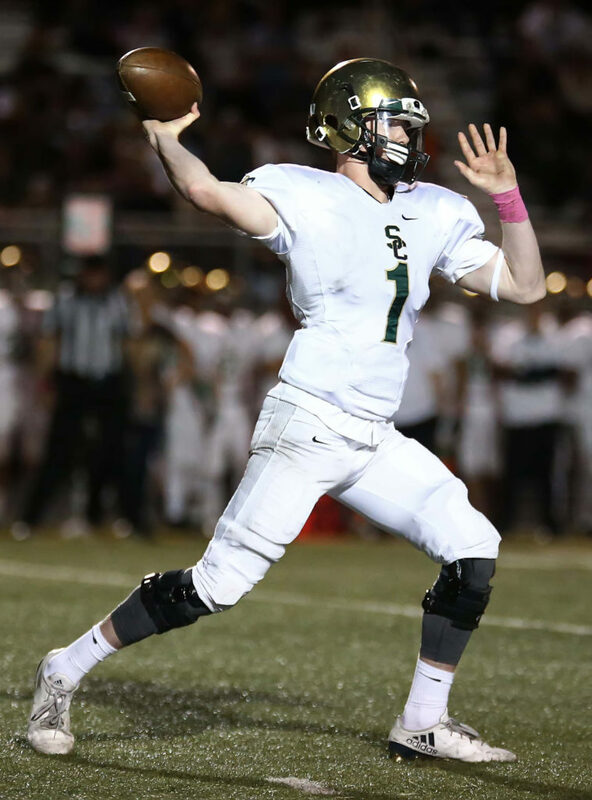 A last gasp pass by Garrett fell incomplete as the clock expired, sealing the Panther win. 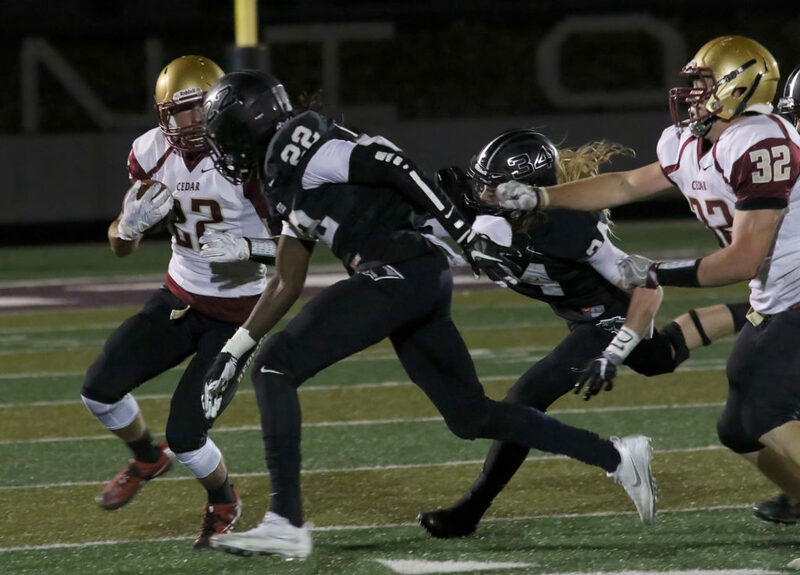 Mpungi had 12 carries for 65 yards and the two touchdowns to lead PV. 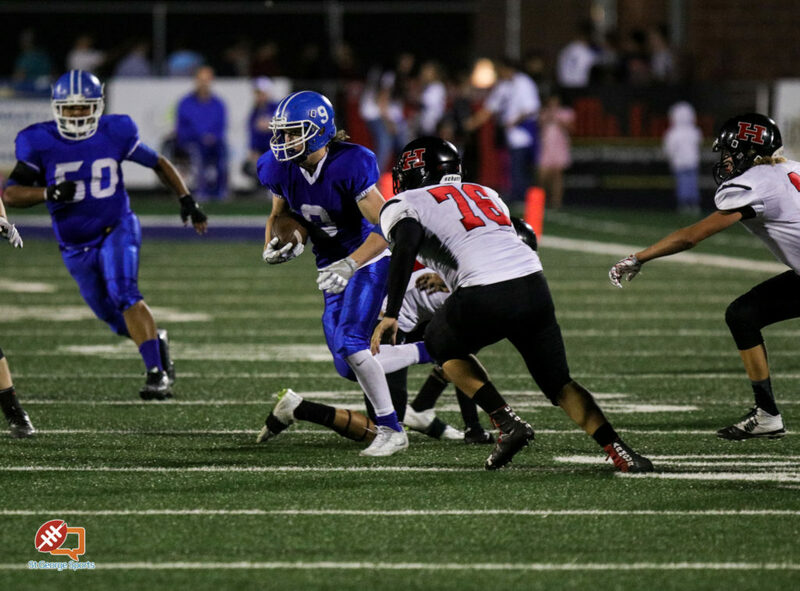 Ryan Javines was 16 of 25 for 161 yards. 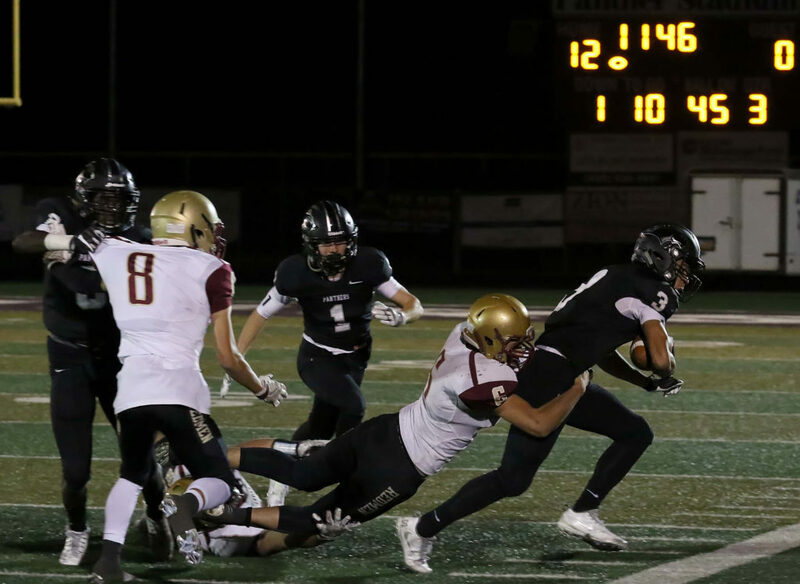 Lance Mandrigues had six catches for 83 yards, including a 21-yarder to the Cedar 3 to set the table for Mpungi’s game-winner. 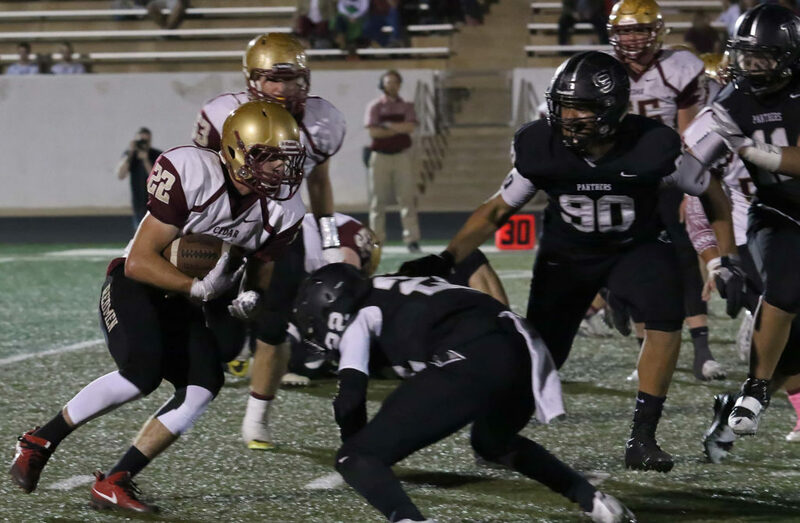 Pine View had 258 yards total offense to 189 for Cedar. 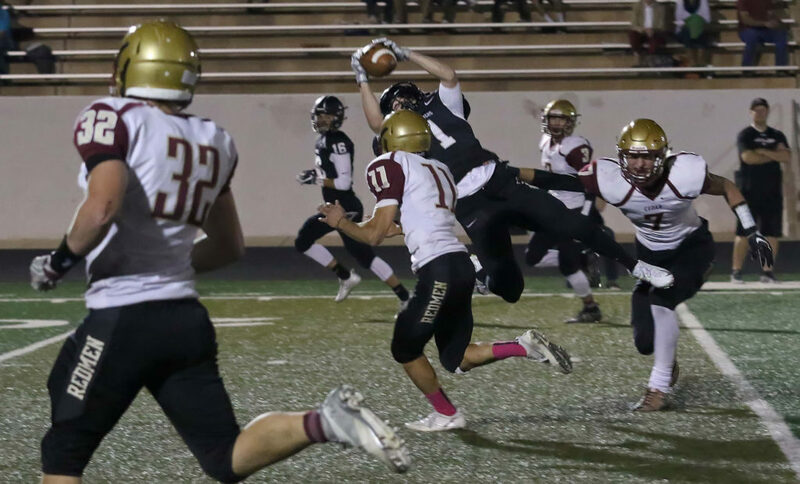 Pine View will open the Class 3AA state playoffs at home against Ben Lomond. 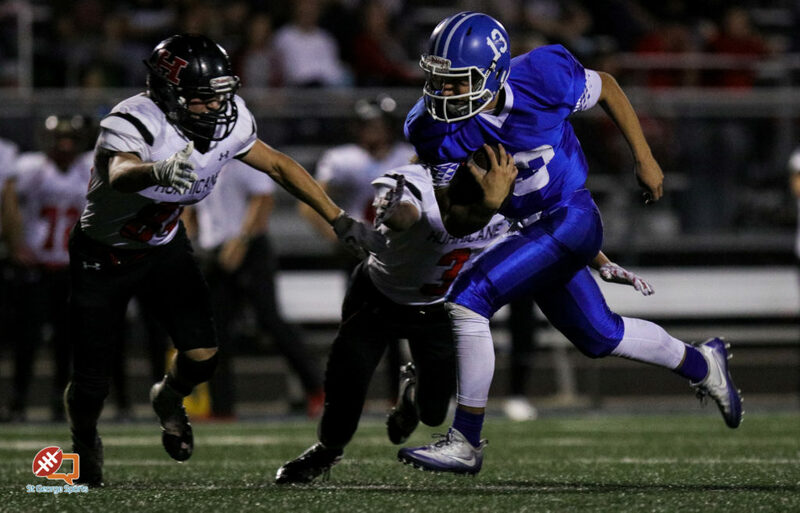 Cedar will also be at home, entertaining Park City. 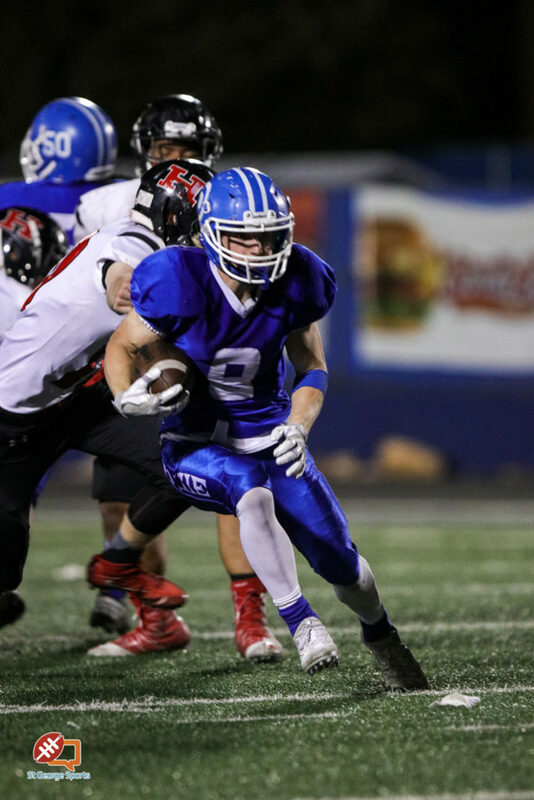 Both games will be Oct. 28 at 4 p.m. unless school officials make other arrangements. 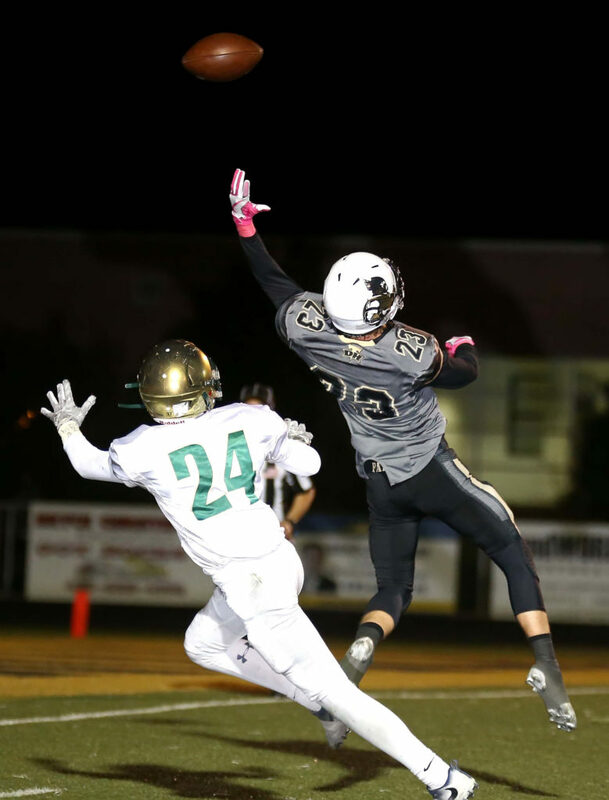 Pine View, 7-2, would play at Tooele, the No. 2 seed from the North, if they beat Ben Lomond. 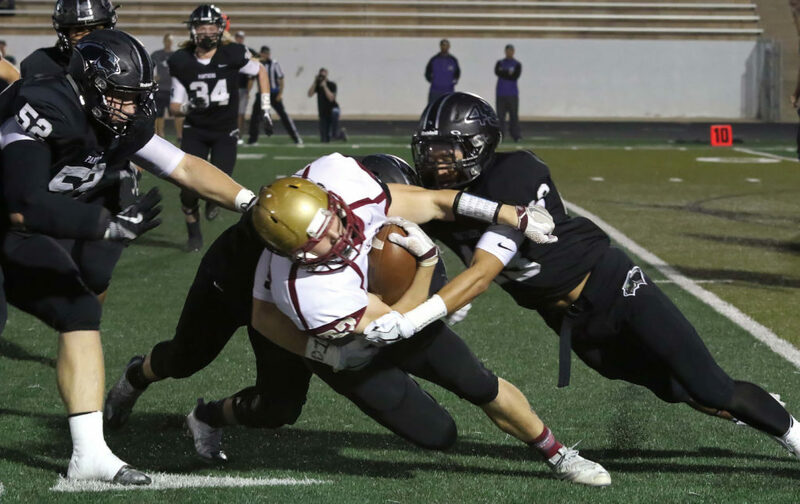 The Scots are 5-5 while the Buffaloes are 9-1. Note – Before the Hurricane-Dixie game, the Flyers honored 94-year-old Spencer Truman, who played football for Dixie in the late 1930s just before going off to fight in World War II. Truman rose to the rank of major in his career in the Army and National Guard, and was part of the secondary unit that landed on Utah Beach in France. He was also part of the allied forces in the Battle of the Bulge. Truman was honored and was also presented a signed game ball from the 2016 Flyers team. So the two worst teams in the region made the playoffs. They will now travel to the other end of the state for a chance to compete for the state championship (or at least, champion of their twelve team league). What was the point of the regular season if not to weed out teams that didn’t really have a claim on being the state’s best team? Why does everyone make the playoffs? 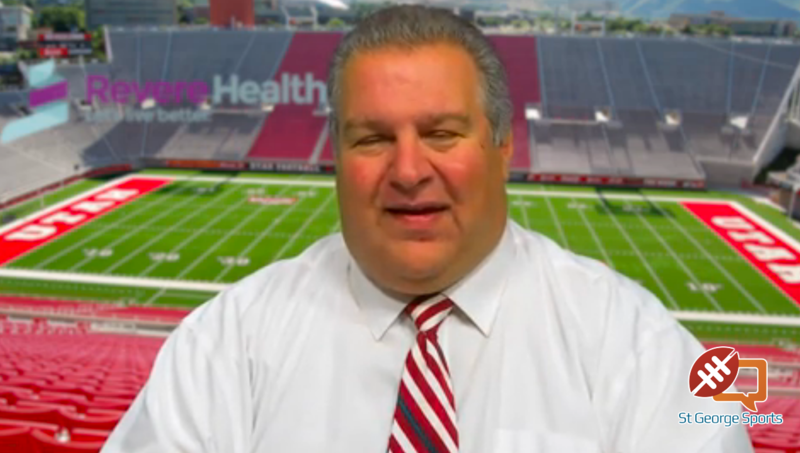 How much tax money will it cost to have Hurricane and Snow Canyon play over 300 miles away? Ridiculous.